A version of this article will be published in 2016 by Truro Cathedral as Truro Cathedral monograph No 7. Violet Pinwill (Figure 010) was the fifth of seven daughters of the Revd Edmund Pinwill, who became rector of Ermington in Devon in 1880 . The church’s woodwork was in dire need of restoration and Mrs Pinwill persuaded the woodcarvers to teach her daughters the craft. 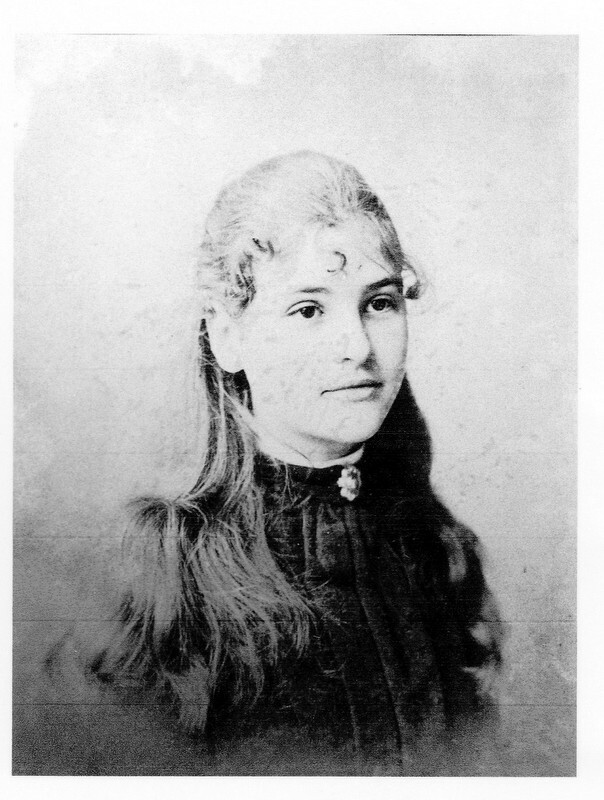 Violet and her sisters Mary and Ethel worked first on the construction of the pulpit. Subsequently they decided to form their own business of restoring and creating woodwork in Devon and Cornwall under the name of Rashleigh, Pinwill and Company, moving to Plymouth in 1900 . When her sisters left the business, Violet managed the firm herself, recruiting and supervising additional carvers, as well as teaching the craft at Plymouth Technical College. Originally specialising in carvings of animals, flowers, fruits and vegetables, she moved on to the representation of religious figures. 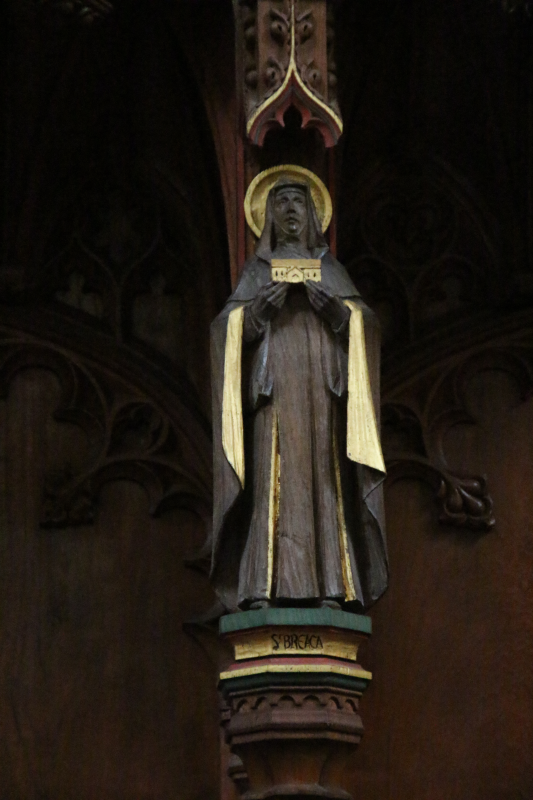 She died in 1957 aged 83 years and her work, catalogued by Helen Wilson, is to be found in over 100 churches. Figure 020. Violet Pinwill’s studio. 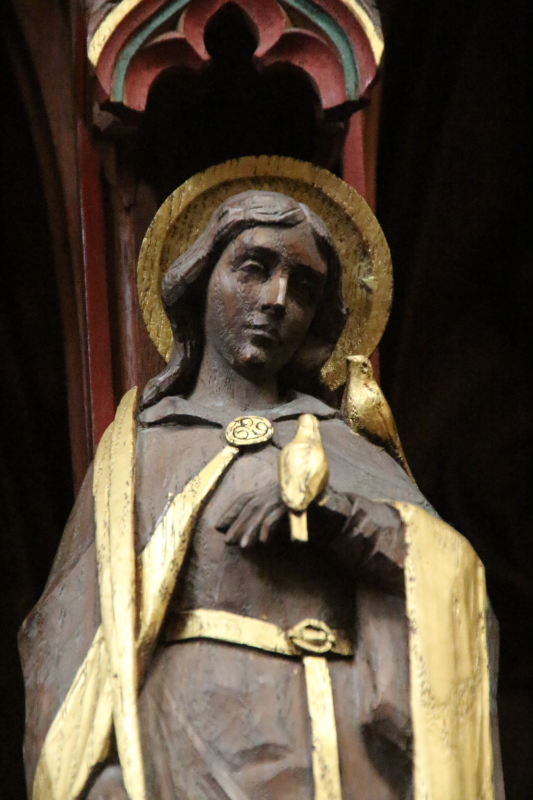 Her most well-known contributions to the fixtures and fittings of Truro Cathedral are the thirty-two figurative carvings in the quire stalls, but the studio was responsible for a wide range of work over several decades. 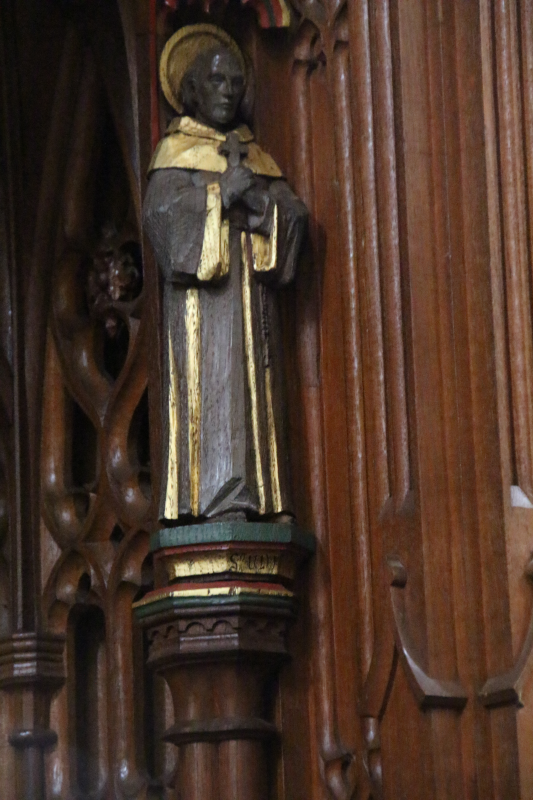 Many Pinwill carvings were installed during the episcopate of Walter Frere, the seventh Bishop of Truro ( 1923–1935 ). 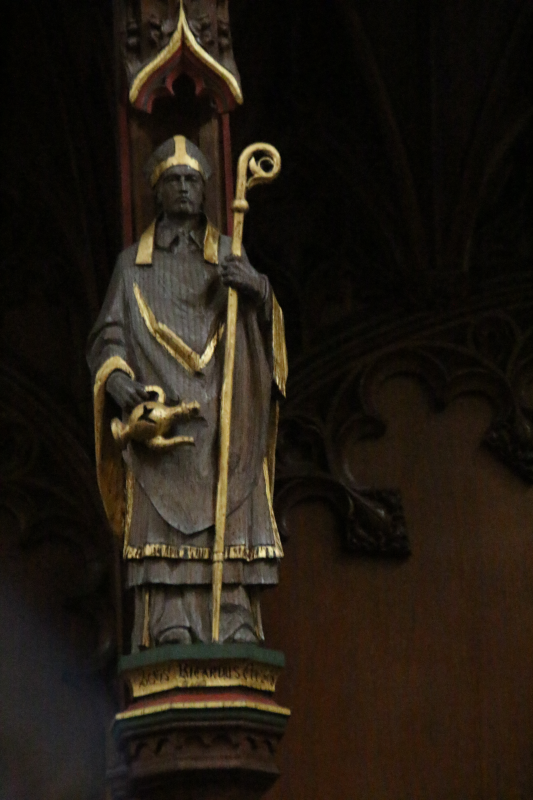 At this time the Bishop was also the Dean of Truro. 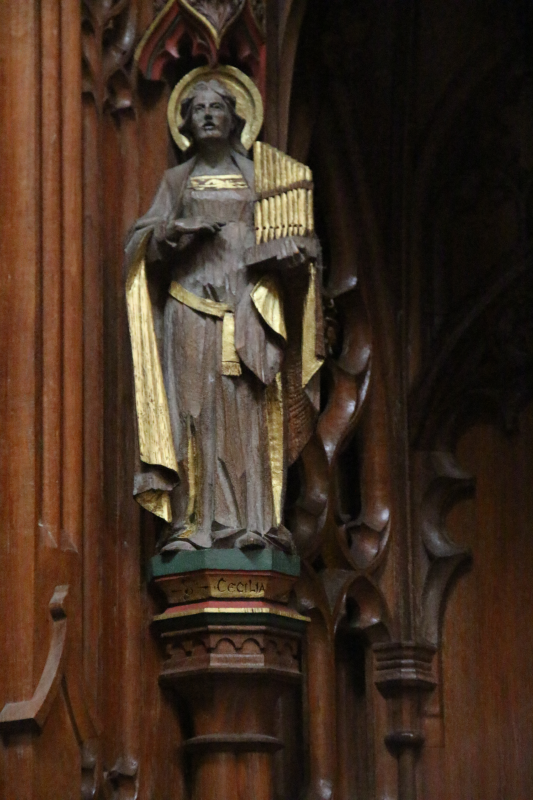 Sadly the dating of her work for Truro is incomplete so, rather than a chronology, this survey has been grouped under liturgical carvings, decorative carvings, and a final category where modifications were made to existing carved woodwork. 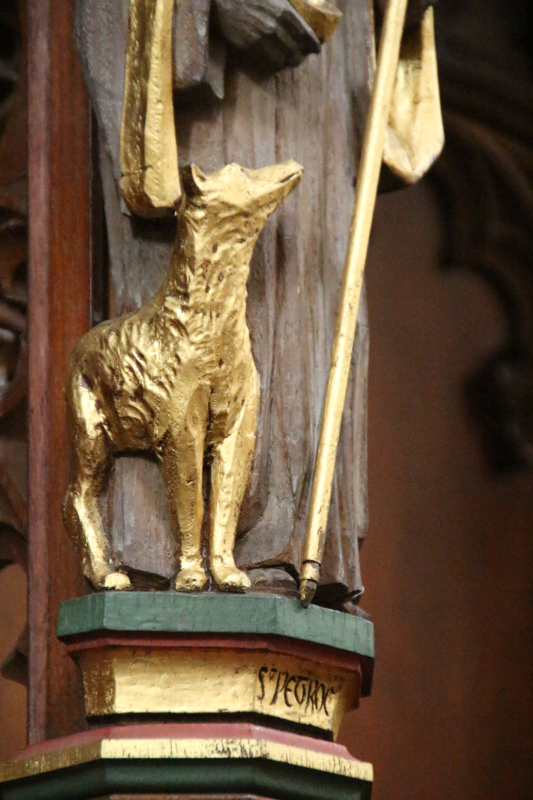 This grouping includes all of the Truro Pinwill carvings that serve a liturgical purpose. Figure 032. The reredos installed in the Chapel of St Samson and St Boniface. 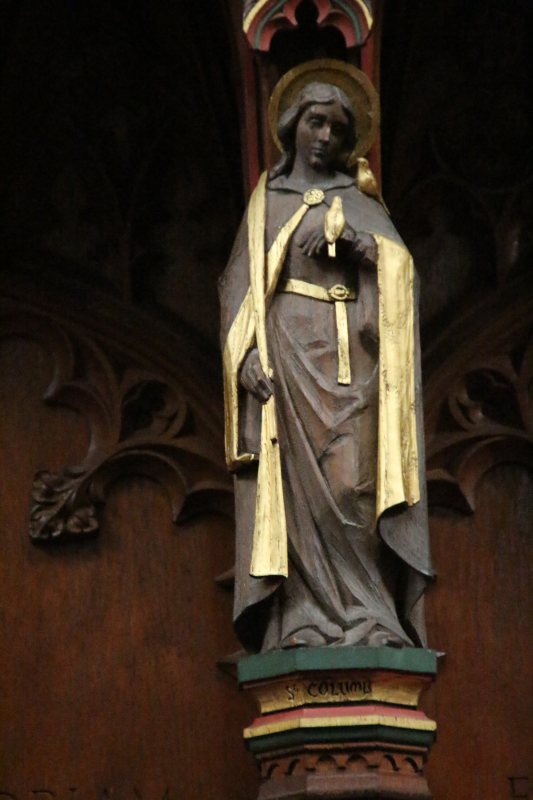 The figures were re-coloured and gilded, possibly at the same time as the Quire statues, after 1945. Figure 033. 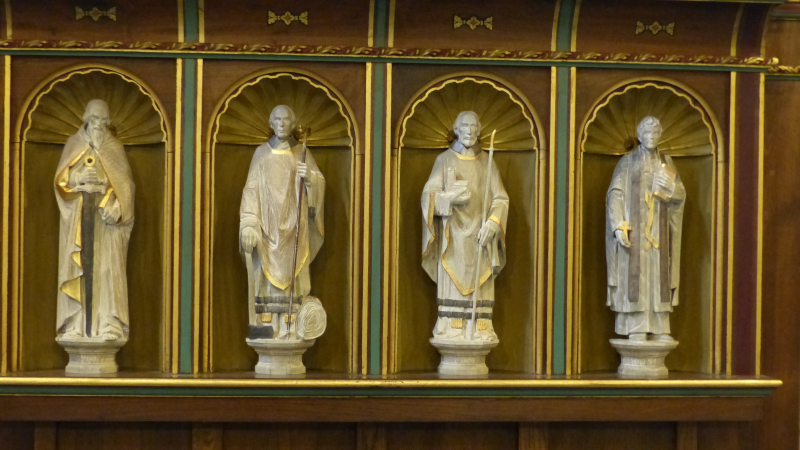 The figures in the reredos the Chapel of St Samson and St Boniface: Saints Paul, Boniface, Samson and the Truro missionary Henry Martyn. Figure 040. 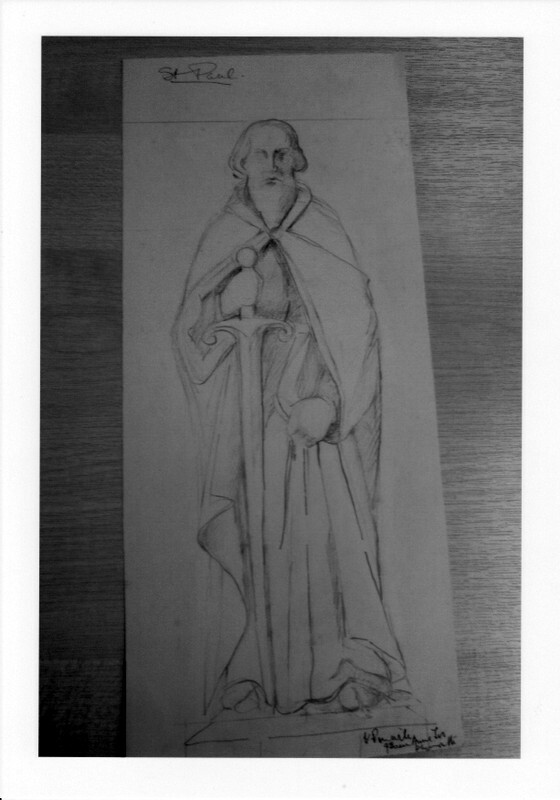 St Paul holding a very large sword, and Violet Pinwill’s original sketch. Figure 042. 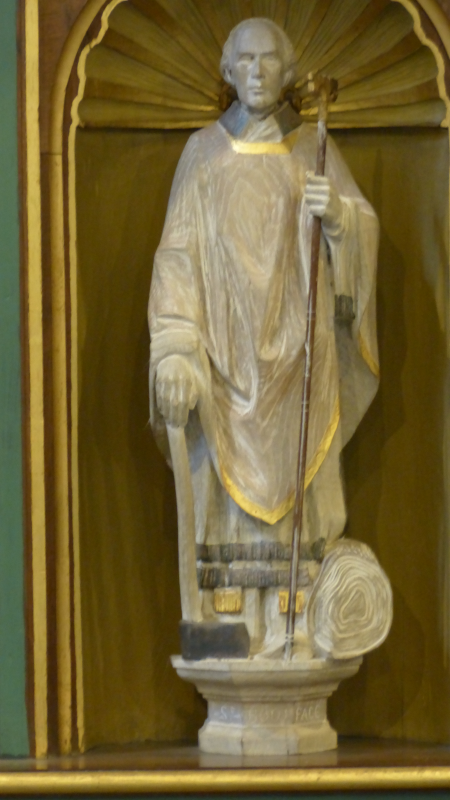 St Boniface, with his right hand resting on an axe. Figure 044. 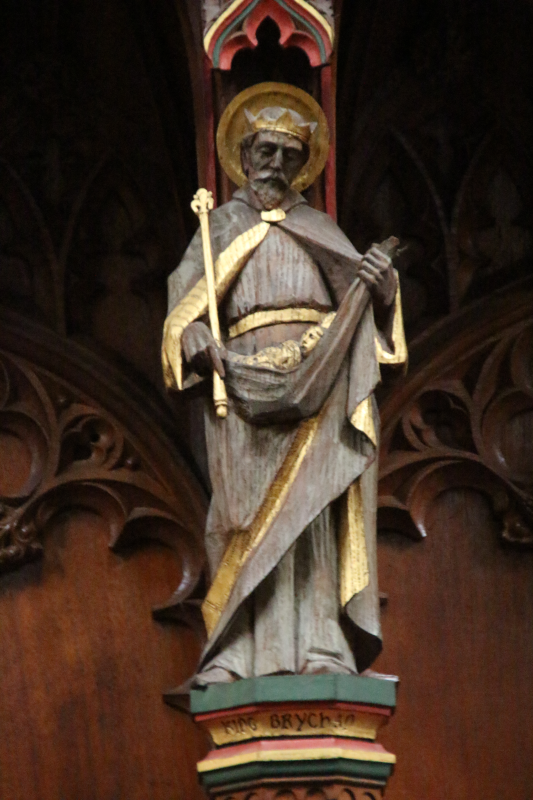 St Samson, holding a model of a church, presumably the parish church of St Samson at Golant. One of Bishop Frere’s innovations was the creation of the Chapel of St Samson and St Boniface from the old Baptistry vestibule. 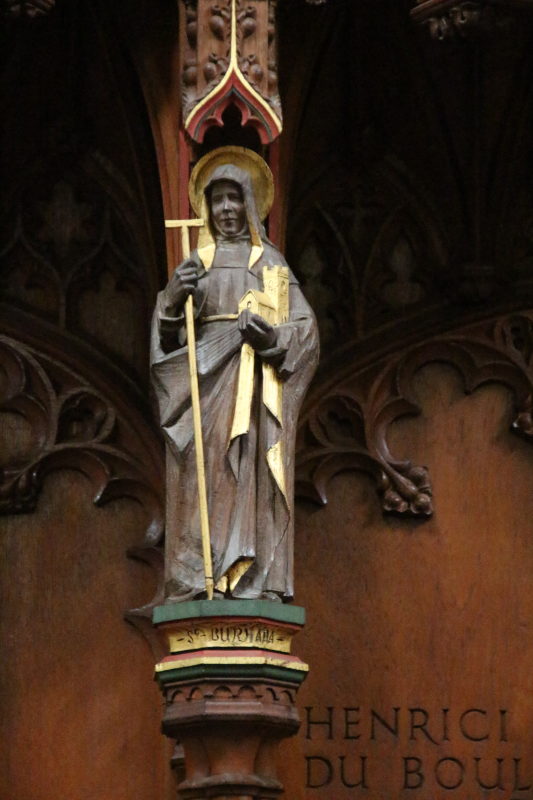 The Pinwill studio made the reredos (Figure 032) for the new chapel and it was installed in 1931 .1 The four statues on the reredos depict Saints Paul, Boniface, Samson and the Truro missionary Henry Martyn. 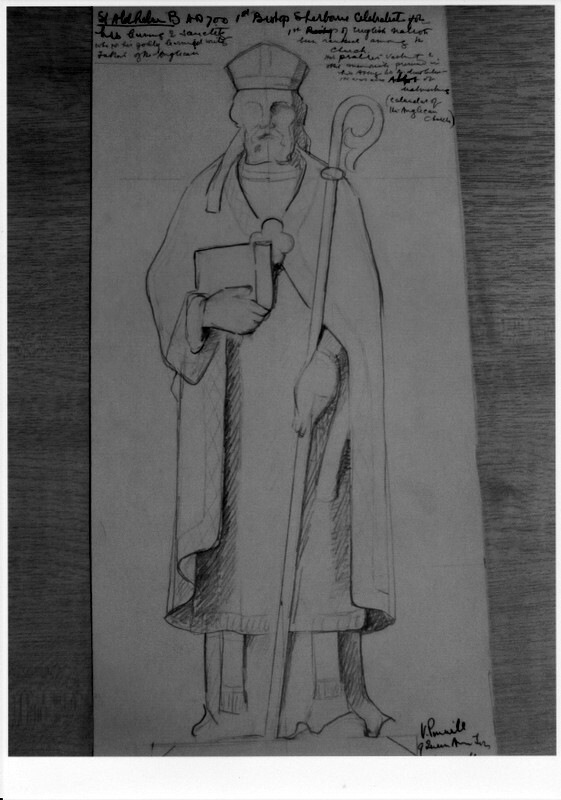 This iconography is based on the Master Scheme drawn up by Bishop Benson and Canon Mason in the early 1880s , in which the theme for the imagery of the whole Baptistry area was Christian Mission by using the Gospels, the Cornish saints and modern examples.2 St Paul is shown holding a very large sword, and the original sketch (Figure 040) is still available.3 Samson is holding the model of a church, presumably the parish church of St Samson at Golant. 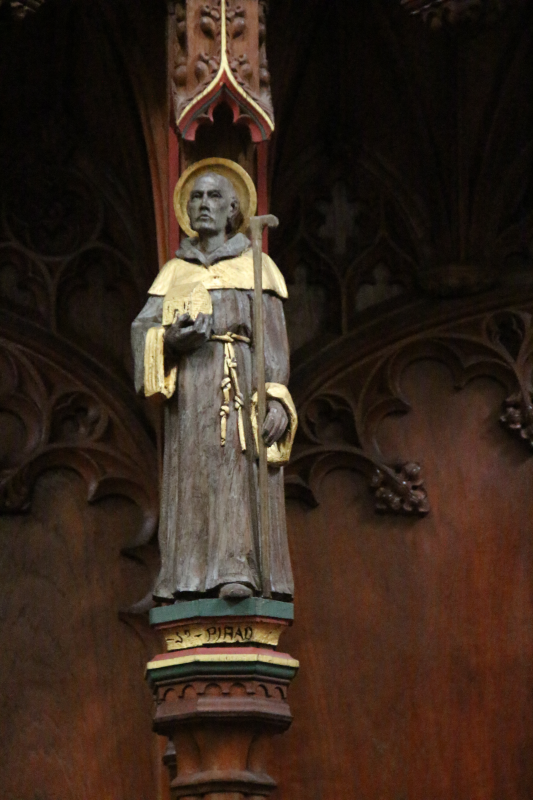 Boniface’s attribute is an axe, and in the adjacent nave window to the Baptistry, dedicated to William Collins, Bishop of Gibraltar and donated by Canon Mason, the first Canon Missioner, St Boniface is depicted felling the pagan oak tree. The final statue is of Henry Martyn, the early nineteenth century missionary to India and Persia. He was born in Truro and his life is shown in the Baptistry windows. Figure 050. 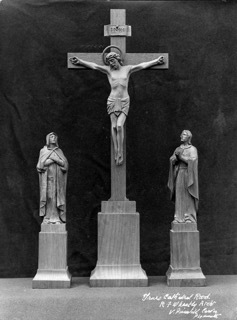 The rood group before installation. Figure 055. IN · PIAM · MEMORIAM WINFRIDI · EPISCOPI TRURONENSIS · QUINTI WALTERUS · SEPTIMUS DD · AD · ⅯⅭⅯⅩⅩⅩⅢ (In loving memory of Winfrid fifth Bishop of Truro, Walter the seventh [bishop] gave [this memorial] in the year of our Lord 1933 ). 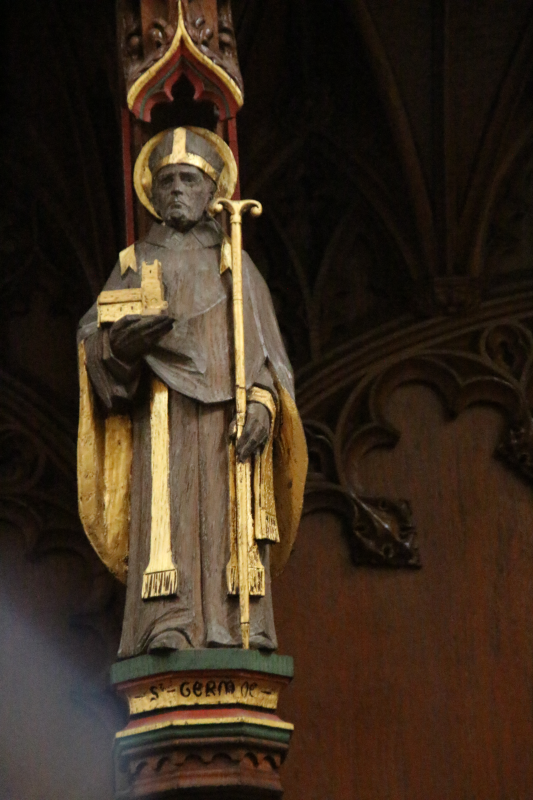 The rood group on the altar in the Chapel of St Monica given by Walter Frere, the seventh bishop of Truro, in memory of Winfrid Burrows, the fifth bishop. Figure 060. IN LOVING MEMORY OF EDWARD FRANCIS TAYLOR HON CANON OF THIS CATHEDRAL AND FOR 15 YEARS DIOSCESCAN [sic] INSPECTOR OF RELIGIOUS KNOWLEDGE DIED JULY 3 1933 AGED 84 YEARS R.I.P. The sanctuary table in the Chapel of All Saints. Figure 110. 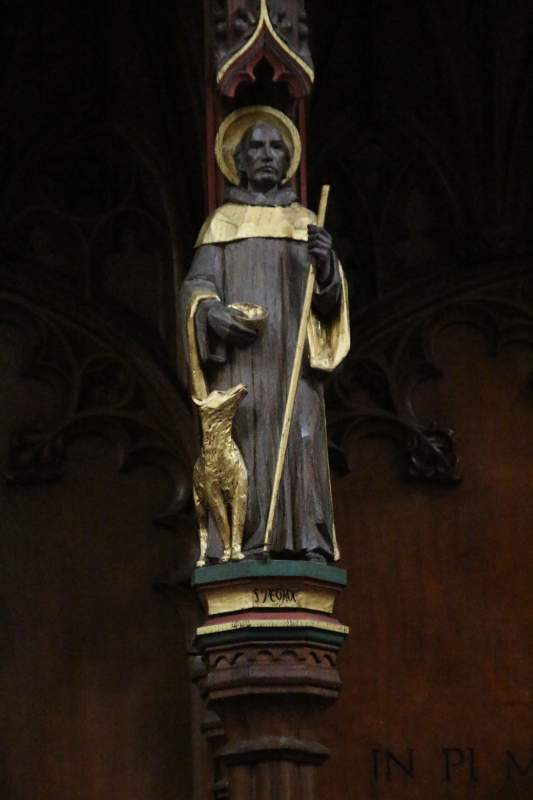 IN LOVING MEMORY OF JOHN RUNDLE CORNISH BISHOP OF ST. GERMANS WHO DIED APRIL 19TH 1918 . The communion rails in the Jesus Chapel. This grouping includes all the Pinwill carvings that were intended to have a primarily a decorative function rather than a part in liturgy and worship, although the war memorial is a focal point of the British Legion service on Remembrance Sunday. Figure 120. FOR · FREEDOM · AND · MERCY · AND · TRUTH. AD MAJ · DEI GLORIAM ET IN P · M · IOHAN · CL · DAUBUZ A · M· HUJUS COMITAT · MAGISTRS VICELEG INTER FUNDATRES HUJUSCE ECCLESIÆ & CURA & BENEVOLTIA CONSPICUI, QUI OBT IN XTO Ⅳ ID · AP · ⅯⅭⅯⅩⅤ (To the greater glory of God and in loving memory of John Claude Daubuz, M.A., magistrate and deputy lieutenant of this county, notable among the founders of this Cathedral for his interest and generosity, who died in Christ on 10th April 1915). Memorial to the fallen of the two World Wars. The memorial to the fallen of the First World War (Figure 120) is modest compared with the monumental commemorative memorial for the Boer War designed by Frank Loughborough Pearson at the end of the south nave aisle. The First World War memorial and desk were made by the Pinwill studio in 1922 , the same year as the civic war memorial that dominates Boscawen Street. 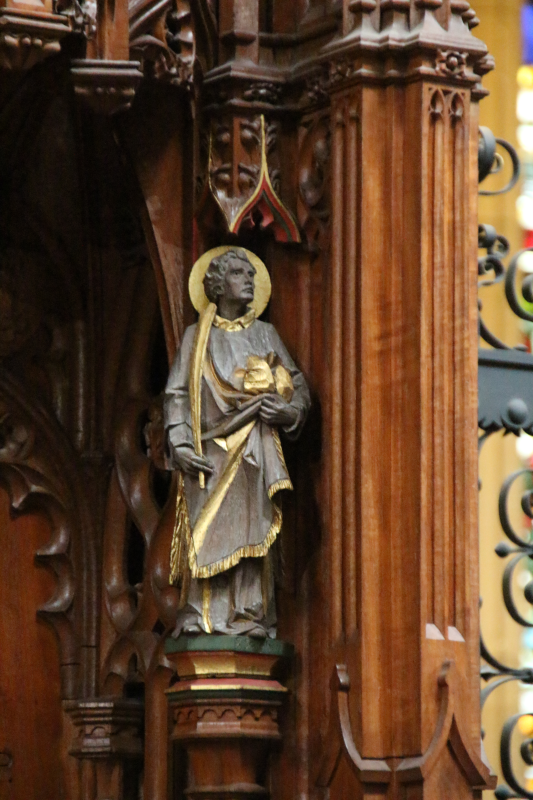 The Pinwill memorial in the cathedral was made in oak that originated from the old St Mary’s church, Truro.8 It was donated by Miss Daubiz in memory of John Claude Daubiz , Deputy Lieutenant of the County and a member of the original Building Committee for the cathedral in the 1880s . This same family also donated stained glass windows in 1847–50 to the old St Mary’s church and which are still in St Mary’s Aisle.9 The memorial was subsequently adapted after the Second World War to include victims of the later conflict. Figure 140. 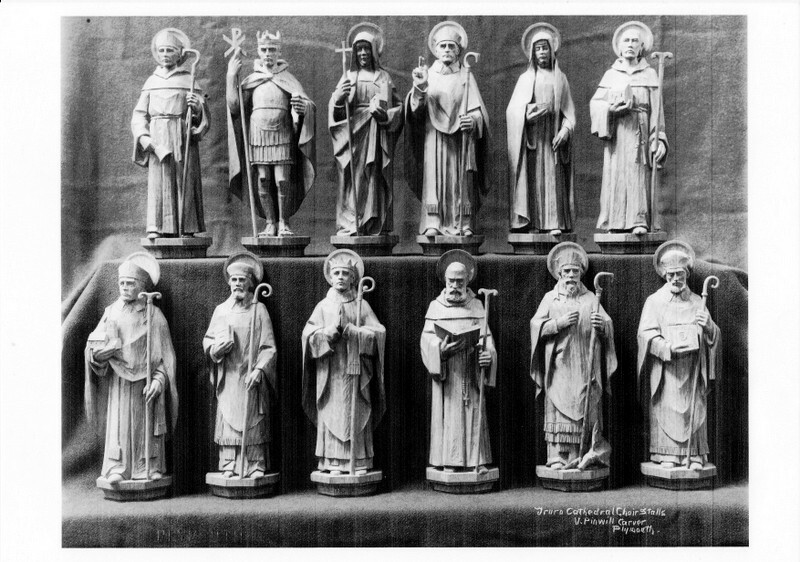 Models for twelve of the saints’ carvings in the quire stalls. Back shelf:- Winwalloe, Constantine, Buriana, Conan, Ia, Piran. Lower shelf:- Germoe, Aldhelm, Meriodocus, Nectan, Germanus, Carantoc. 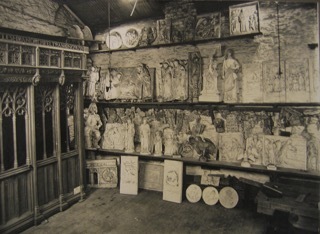 Cathedral Archive sources11 include a photograph (Figure 140) of twelve of the statues displayed on two shelves, probably taken in the Pinwill Plymouth studio.12 As these statues were inserted over a period of twenty years it is possible that they were clay models that Pinwill often made as a guide for the final carving. They also reveal extra details that show the extent of the damage that the statues have suffered. 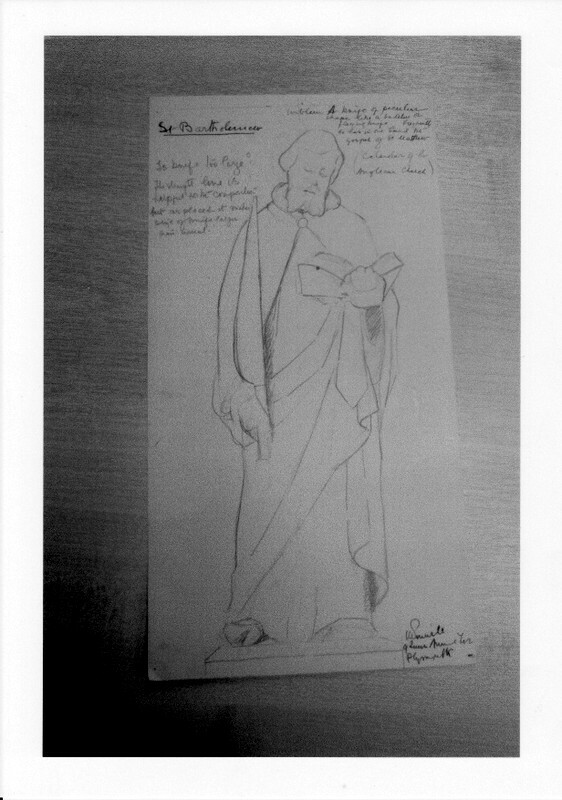 The archive also contains the original sketches for eleven of the statues, with written comments by Violet Pinwill.13 Reference is made below to differences between the sketches and the final product. The sketches obviously pre-date the production of the clay models which must have been made by 1924 at the latest. Figure 150. SQ1. 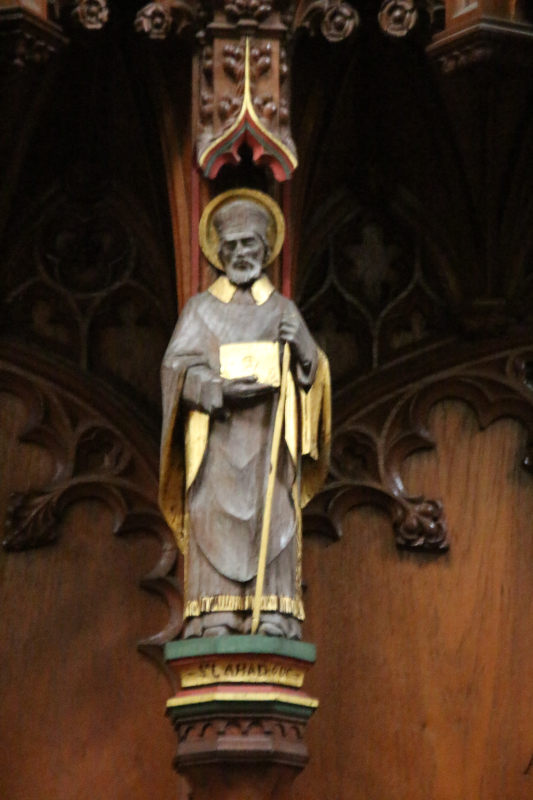 St John, inserted 1912–1929 , has a bible in his right hand. 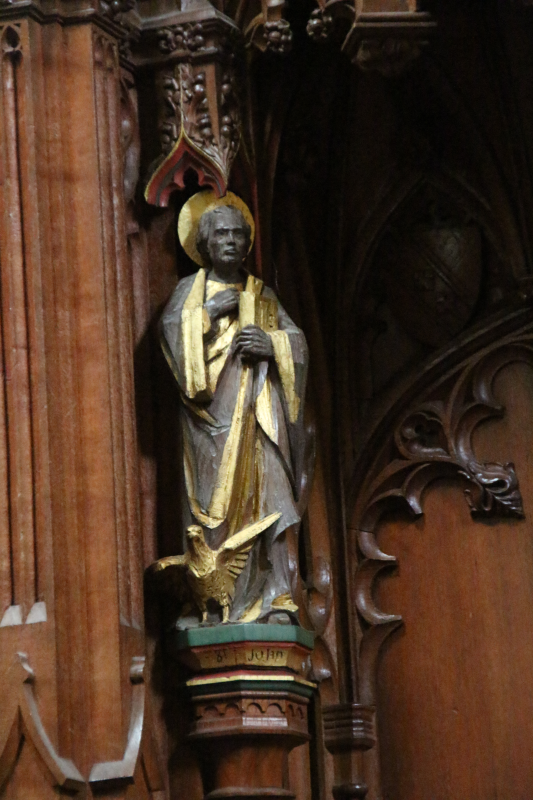 St John’s evangelistic emblem of an eagle with outstretched wings is at his feet. Figure 160. SQ2. 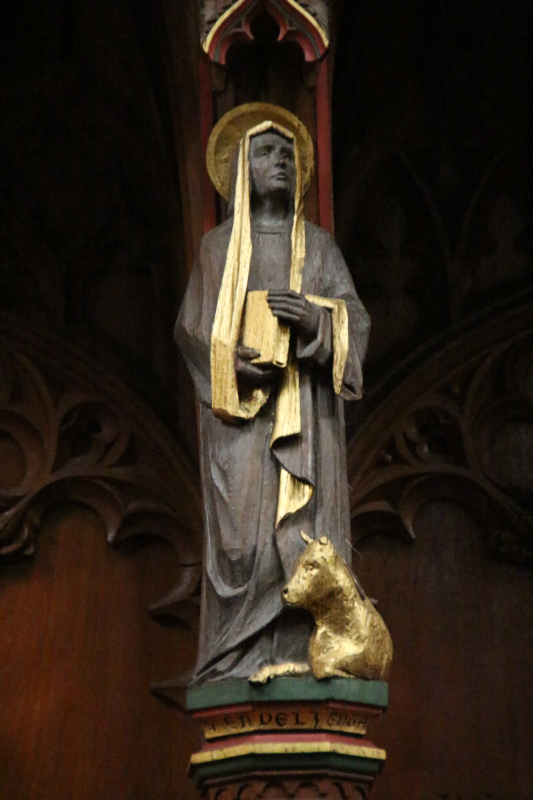 St Margaret of Antioch, inserted 1929–35 , is wearing a coronet and holding a bible and pastoral staff. Round her feet is curved a very characterful dragon. Figure 180. SQ4. St Germanus, inserted November 1924 , is shown mitred and holding what was originally a full crook, since damaged. A dead stag is at his feet, and Pinwill’s comments on her sketch are with dead and hunted animals lying around him. Figure 190. SQ5. 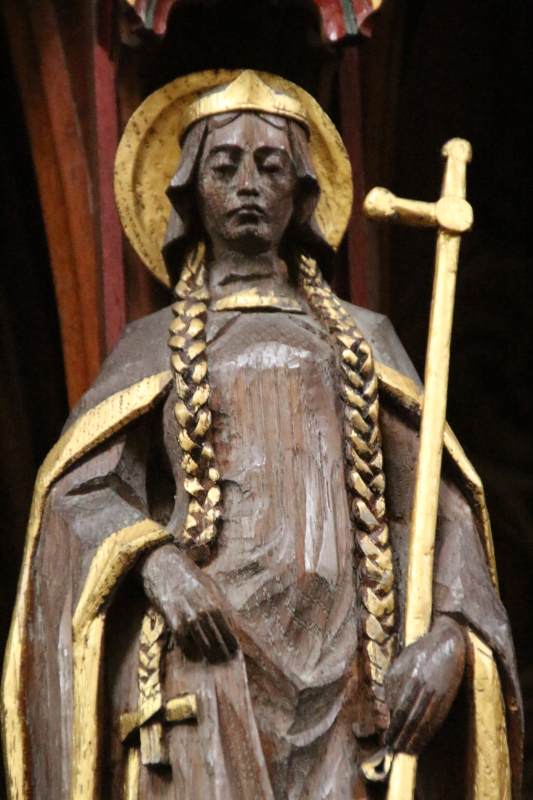 St Wenn, inserted 1924 , is wearing a coronet and has long braided hair with delightful bows! 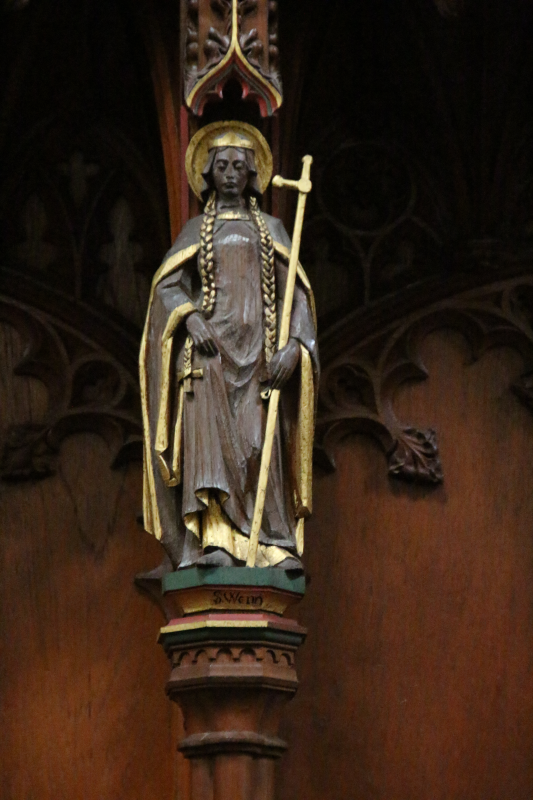 She is holding a pastoral staff. Figure 200. SQ6. 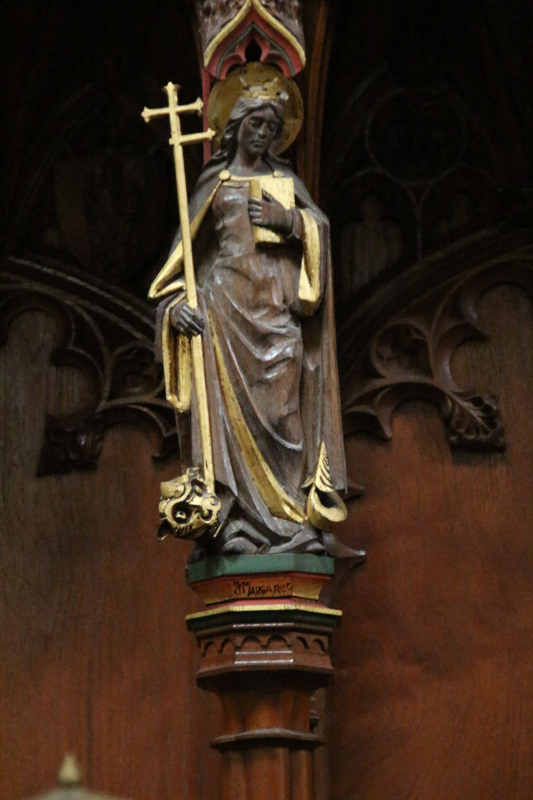 St Carantoc, inserted 1927–44 , is shown mitred and holding a Bible and pastoral staff with crooked end. There was originally a small bird on his left shoulder (now missing). Figure 210. SQ7. 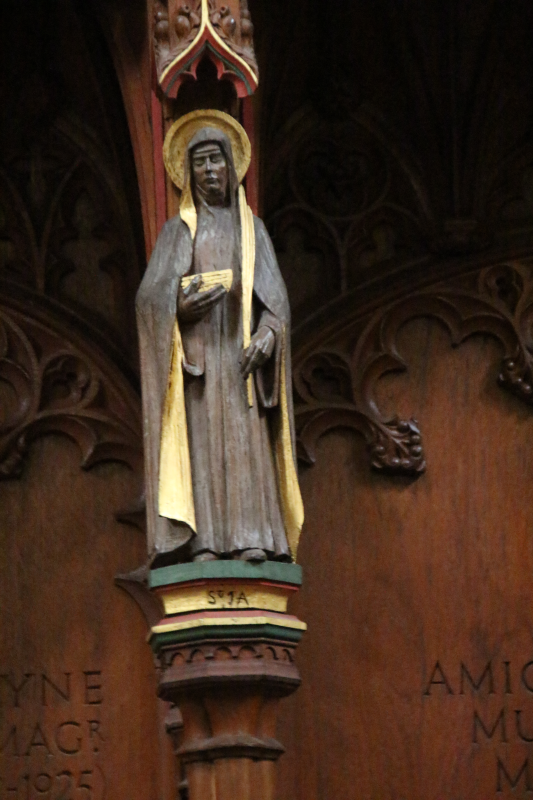 St Buriana, inserted 1927–44 , is wearing a nun’s habit and holding a pastoral staff with a cross on it, now damaged. 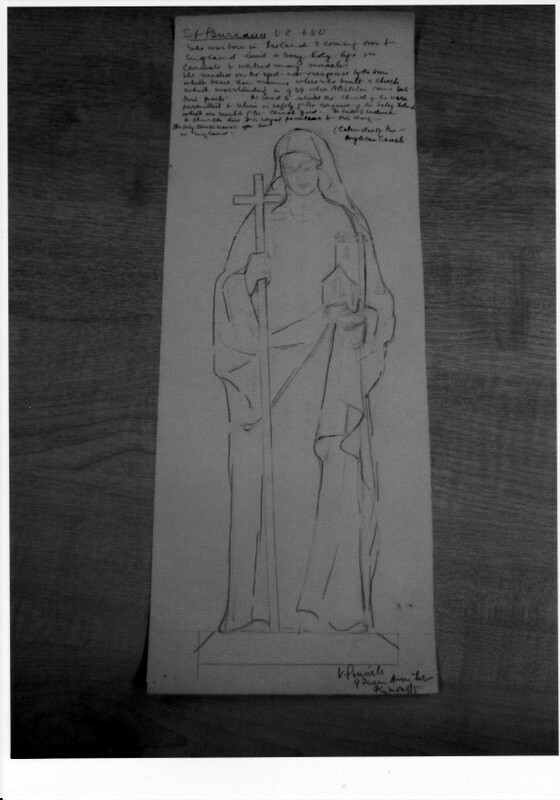 She is also holding a model of a church with tower, which Pinwill comments on her sketch represents the parish church of St Buryan in West Penwith. Figure 220. SQ8. 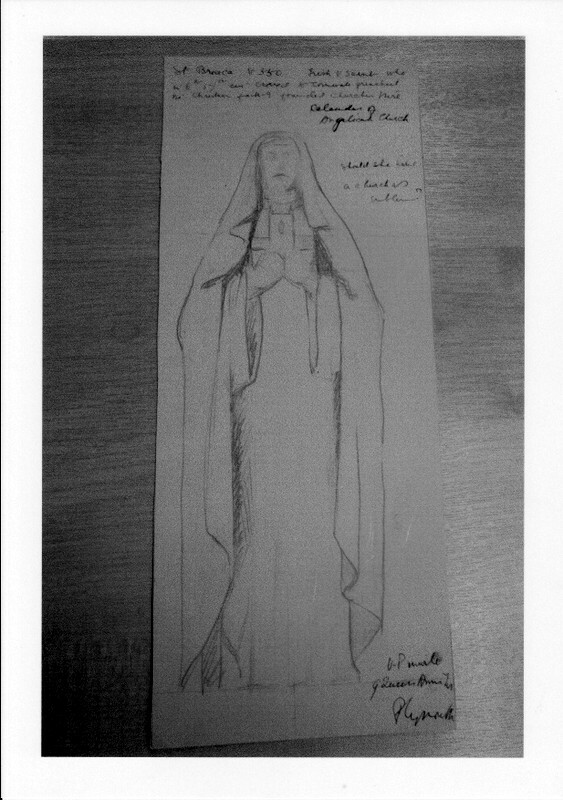 St Ia, inserted 1927–44 , is wearing a nun’s habit. Her right hand holds a model of a boat whilst her left hand holds a martyr’s palm. Figure 230. SQ9. 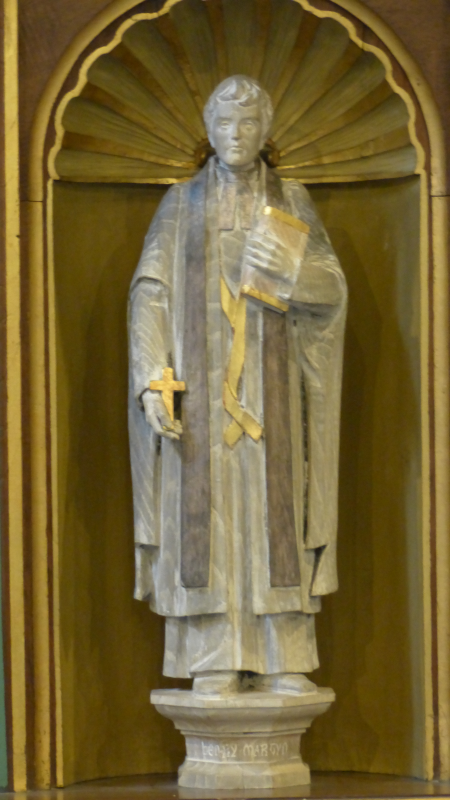 St Piran, inserted 1927–44 , is shown wearing monastic habit. 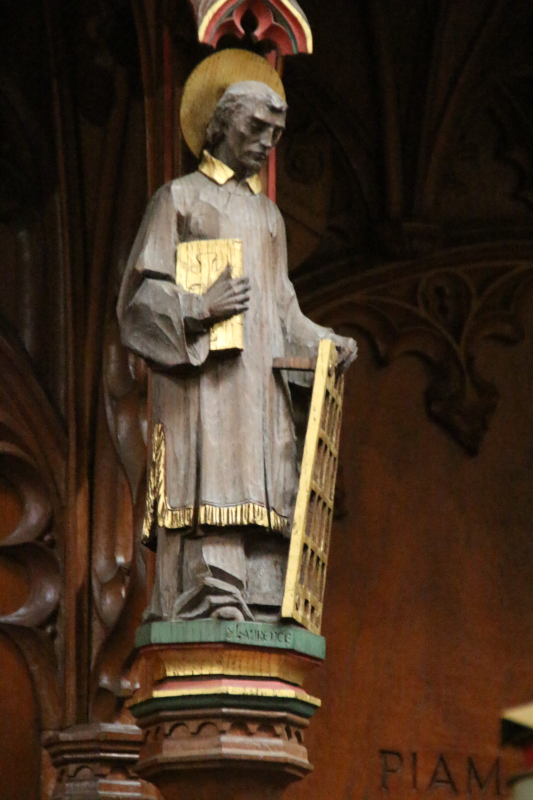 He holds a model of his oratory in right hand and in his left what was originally a T staff, since damaged. 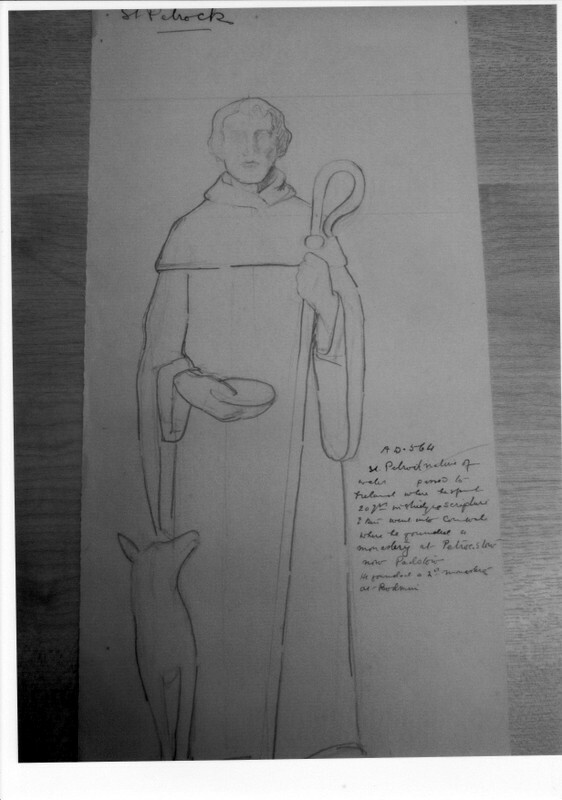 In the original sketch, Violet Pinwill suggested him holding a rock with a spring of water, but this was replaced by the oratory presumably to avoid confusion with St Stephen’s attribute (NQ1) of the rocks of his martyrdom. Figure 240. SQ10. 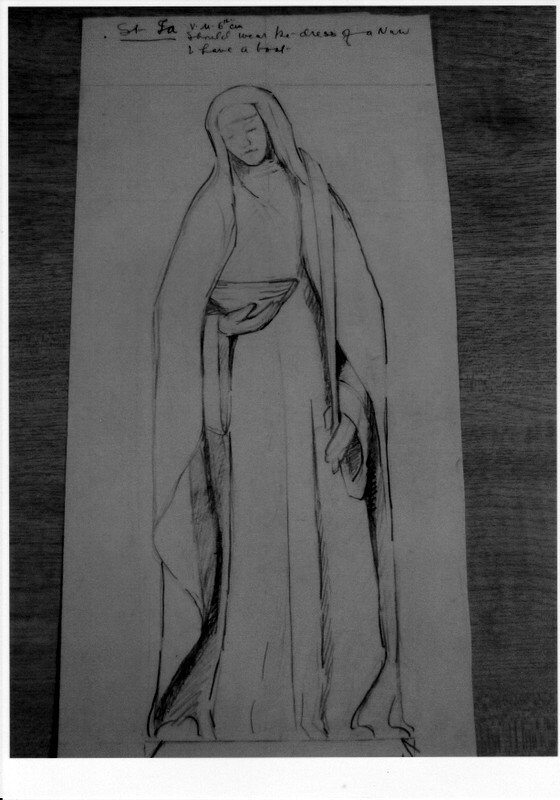 St Breaca, inserted 1930–44 , is shown wearing a nun’s habit. 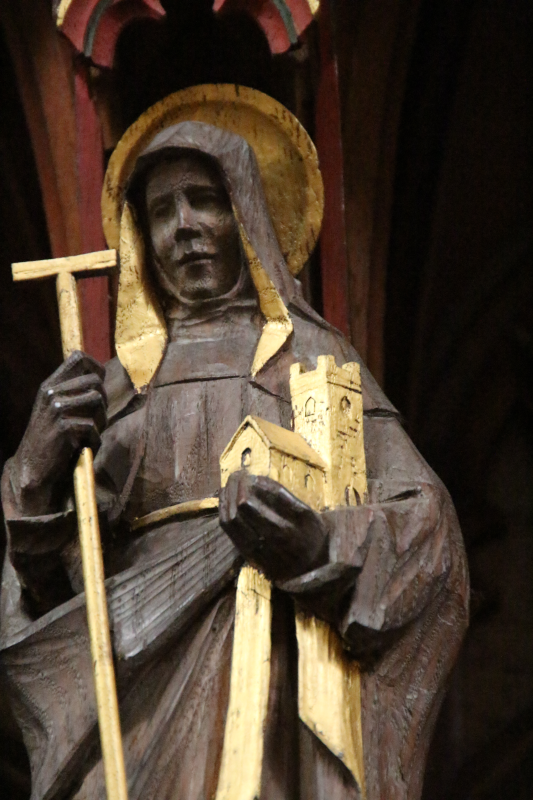 She is holding a model of a building which represents the church at Breage. Pinwill’s sketch does not include the church, but has the comment should have a church as an emblem. Figure 250. SQ11. St Petroc, inserted 1930–44 , is clothed in monastic habit. He is holding a bowl and a crooked pastoral staff, now damaged. At his foot is a sheep rather than his usual attribute, a stag. Figure 260. SQ12. 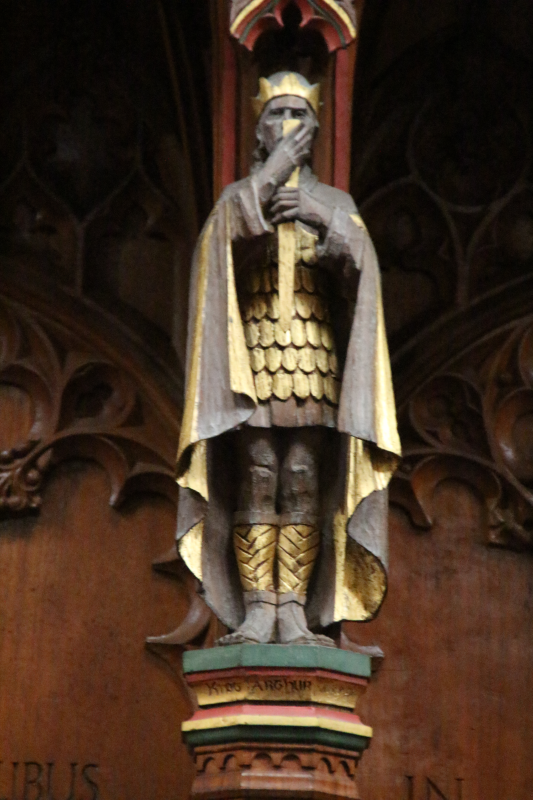 St Constantine, inserted 1930–44 , is in armour and wearing a coronet. 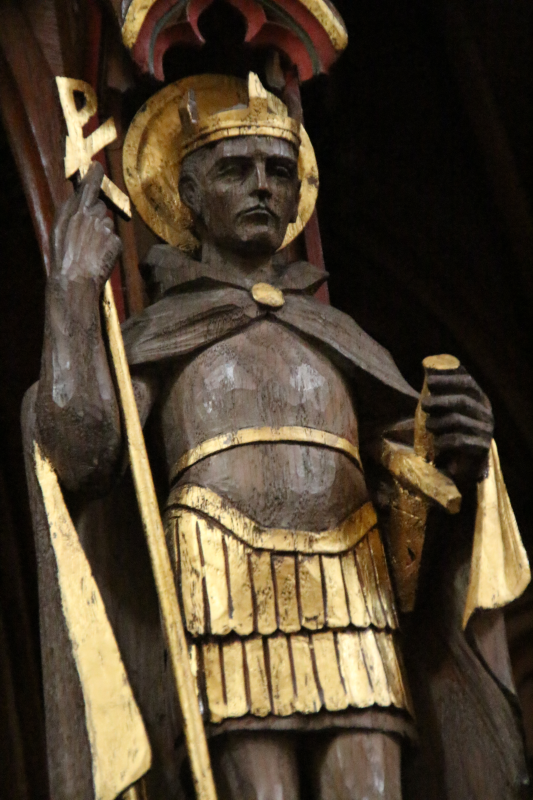 He is holding a labarum, a military standard displaying the chi-rho symbol ☧, since damaged. His left hand is on a sword. Figure 270. SQ13. 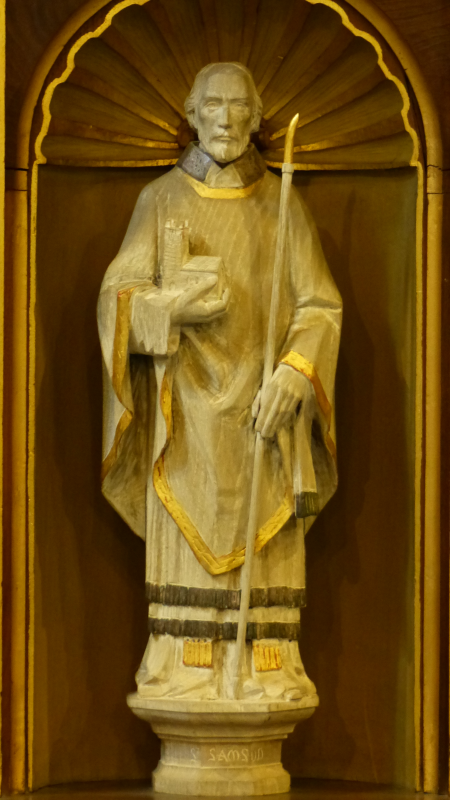 St Richard, inserted 1912–29 , is wearing a mitre and holding a bishop’s crozier. He has a flagon in his right hand. 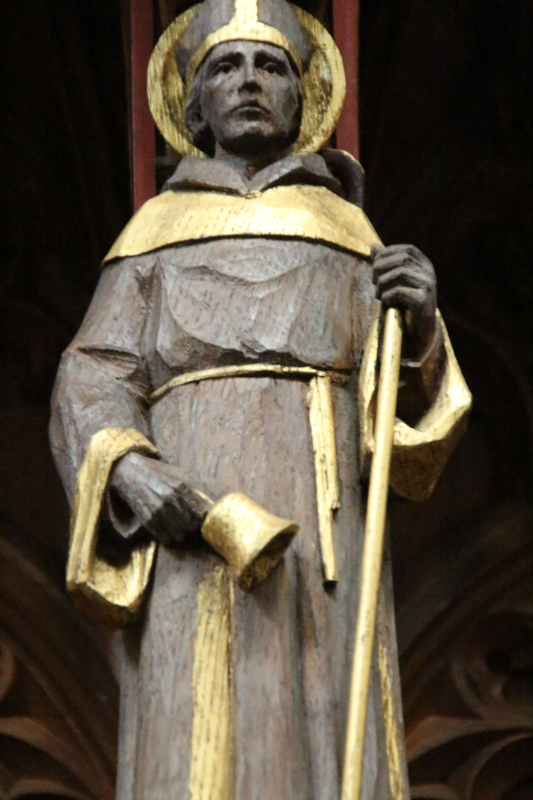 This statue is of St Richard of Chichester, 1197 – 1253 , also featured on the reredos of All Saints chapel. Figure 280. SQ14. 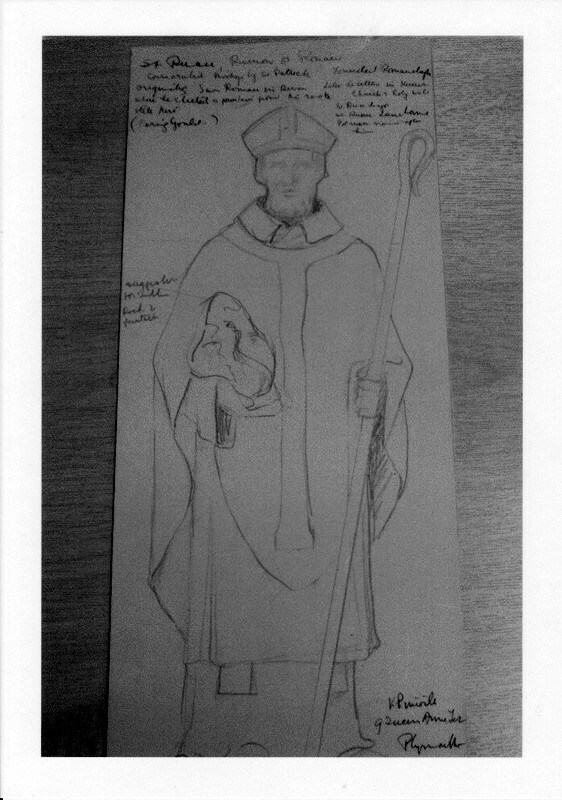 St Germoe, inserted 1930–44 , is in priestly attire holding a T-shaped pastoral staff. 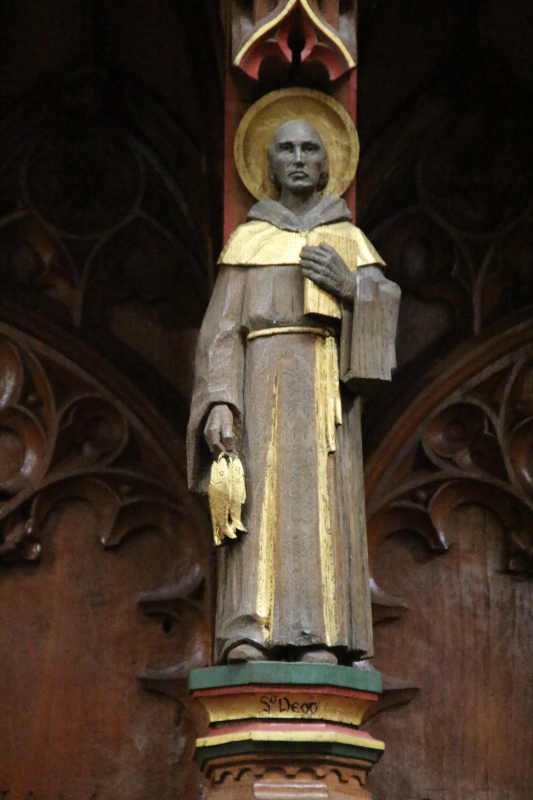 His right hand holds a model of a church with tower, which is probably the parish church of St Germoe. Figure 290. SQ15. 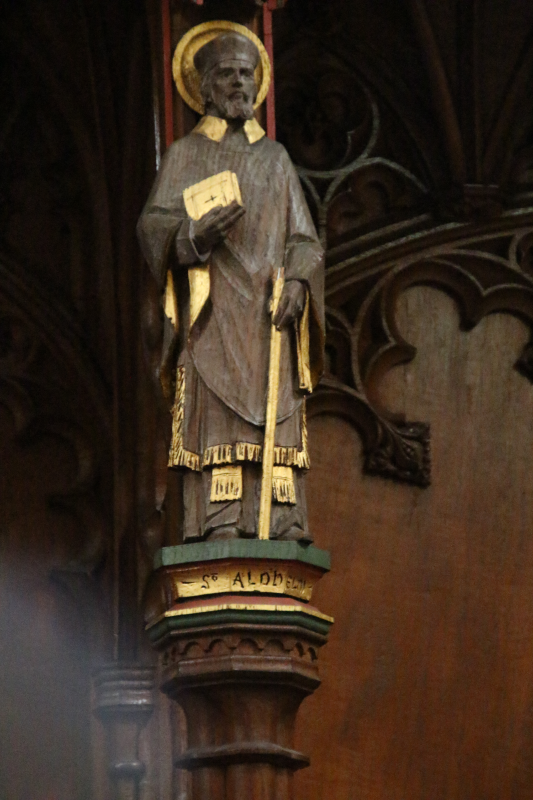 St Aldhelm, inserted 1930–44 , the first Bishop of Sherborne, 715 AD , is shown mitred and holding a bible and what was originally a full crook, since damaged. Figure 300. SQ16. 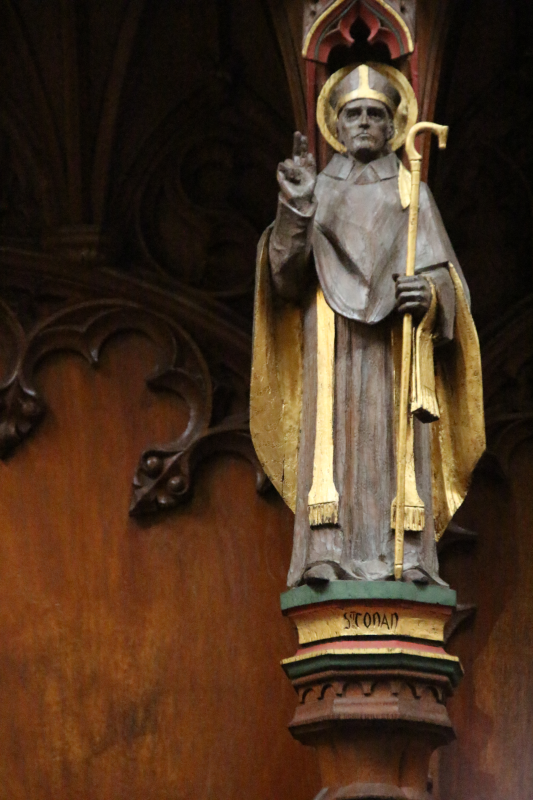 St Uni, inserted 1912–1929 , is shown in monastic habit and holding a Latin cross to his chest. Figure 310. NQ1. 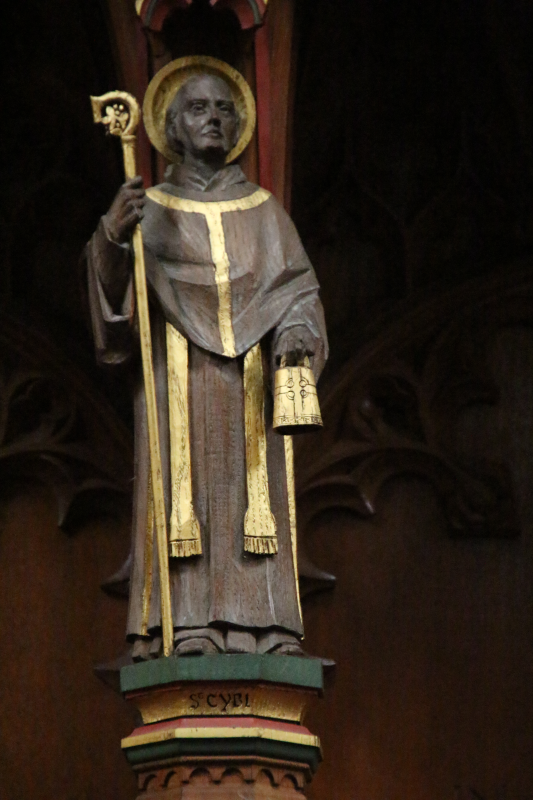 St Stephen, inserted 1927 15, is clothed in Deacon’s vestments. He has a martyr’s palm and holds two rocks in his left hand as a symbol of his martyrdom. 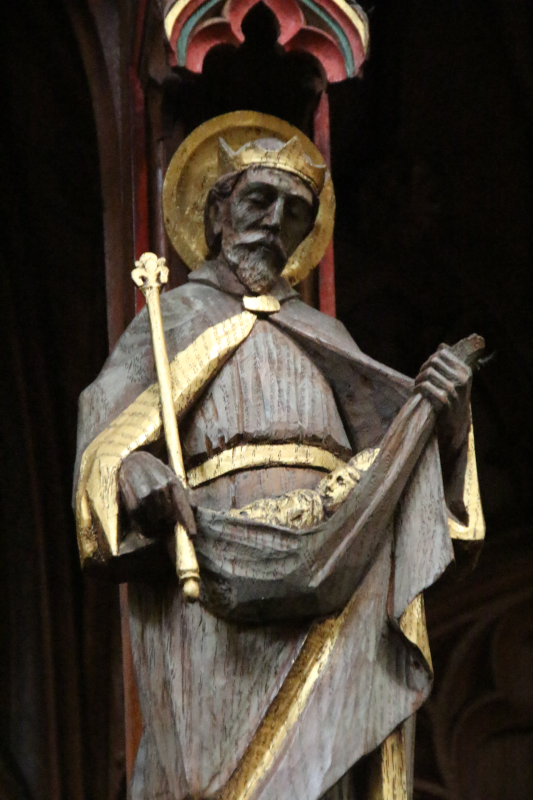 His name, like that of St Lawrence (Figure 320), is inscribed on the blue-green pedestal immediately below his feet, rather than on the gold support below it where the subjects of most of the other statues have their names. Figure 320. NQ2. 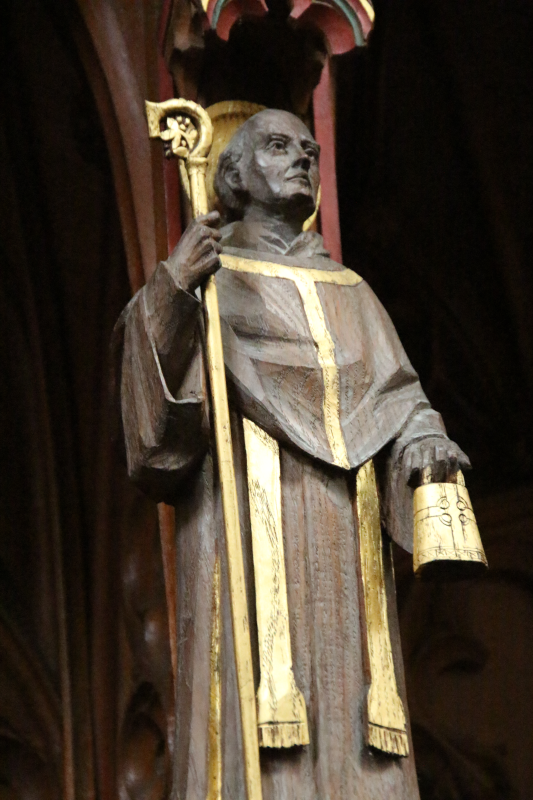 St Lawrence, inserted 1927 16, is clothed in Deacon’s vestments. He holds a bible and his usual attribute of a grid-iron. 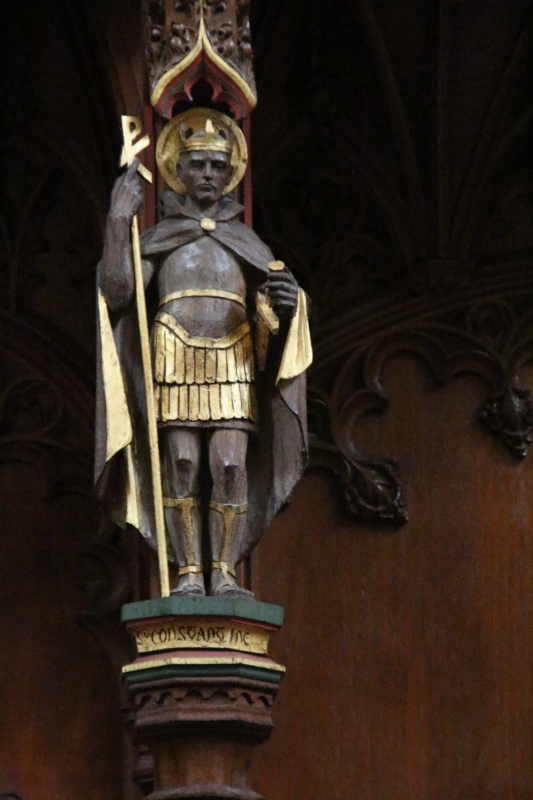 His name, like that of St Stephen (Figure 310), is inscribed on the blue-green pedestal immediately below his feet, rather than on the gold support below it where the subjects of most of the other statues have their names. Figure 330. NQ3. St Rumon, inserted in 1944 17, is shown mitred. 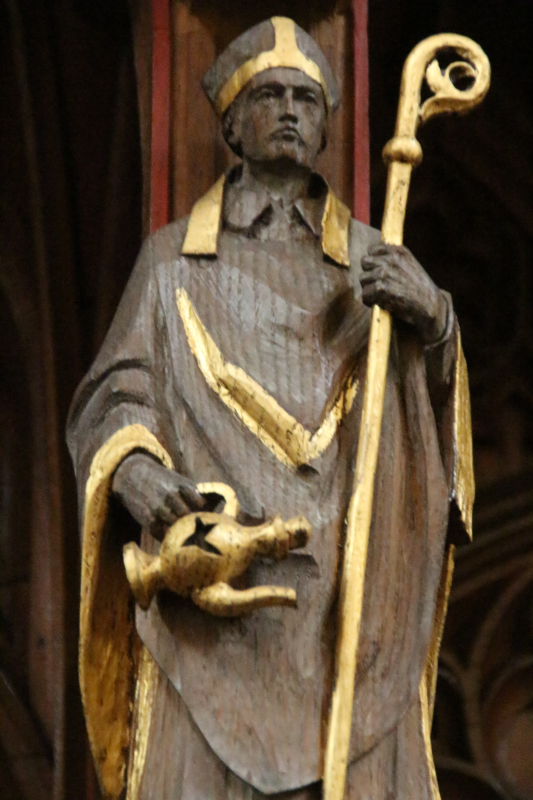 He is giving a blessing and holding a bell and a pastoral staff with crooked ending. Figure 340. NQ4. St Neot, inserted in 1944 , is in monastic habit. He has a Bible in left hand and three fishes in his right, a reference to the medieval legend of St Neot.18 The original sketch shows him holding a hunting horn and a stag by his side, a reference to another medieval legend of him taming wild stags after the villagers’ livestock had been stolen.19 The alteration was made presumably to avoid confusion with the stag in SQ4 St Germanus. Figure 350. NQ5. King Arthur (no insertion date20) is shown crowned and in armour. 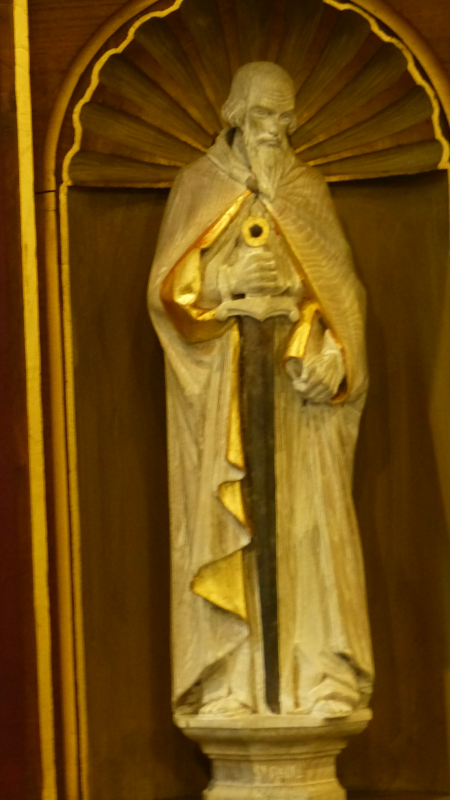 He is holding a sword, probably Excalibur, the hilt of which seems to be missing. Figure 380. NQ8. 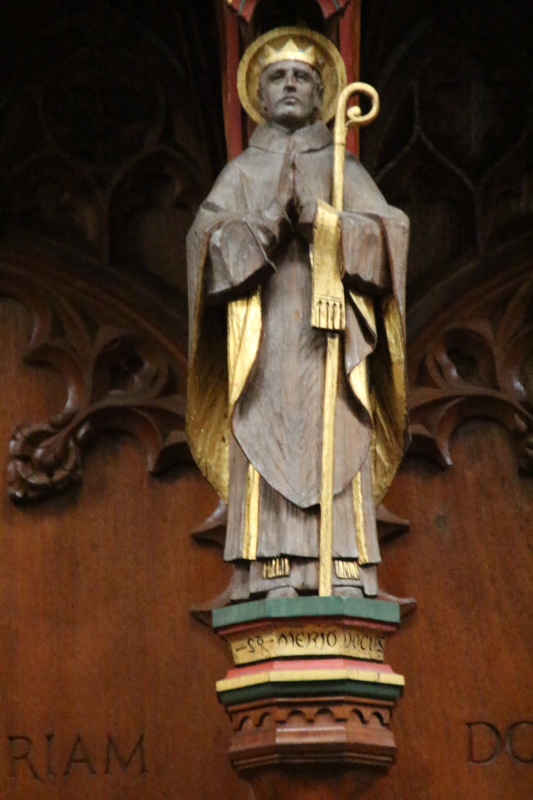 St Columb, inserted 1929–44 , is in a simple tunic. 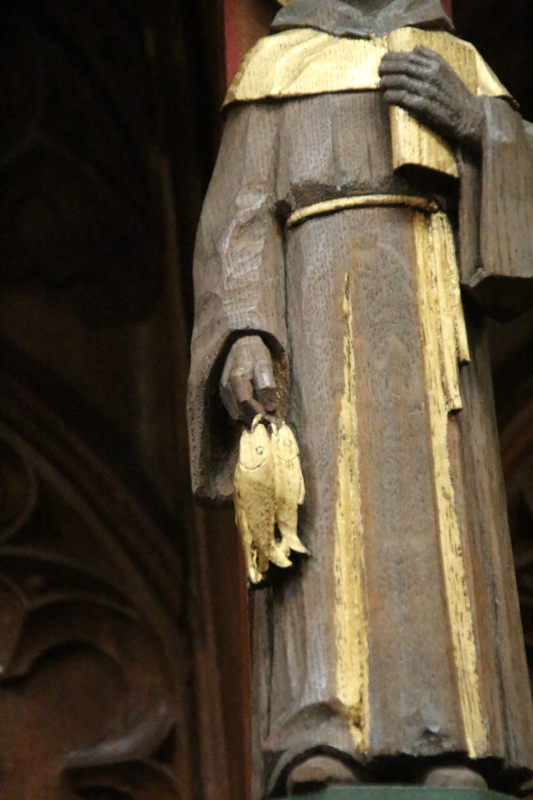 He holds a martyr’s palm in his right hand, with a dove on his left hand and another on his shoulder (Columba—Latin = dove). Figure 400. NQ10. 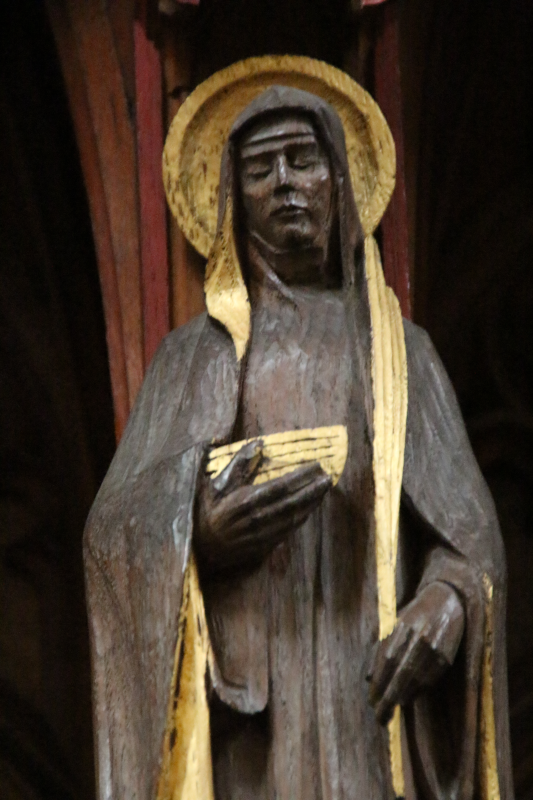 St Endelienta, inserted 1938–45 , holds a Bible in both hands. There is a bull at her feet. Figure 410. NQ11. 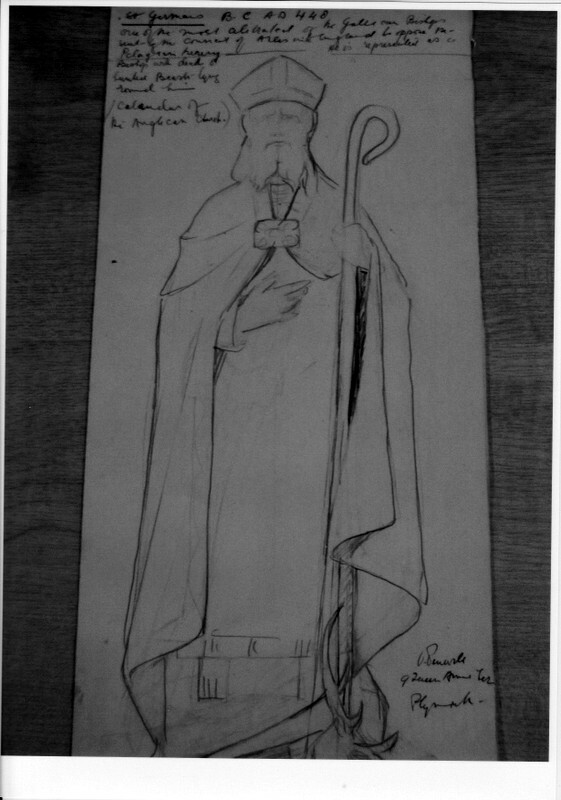 St Cybi, inserted 1934–44 , is in priest’s attire. 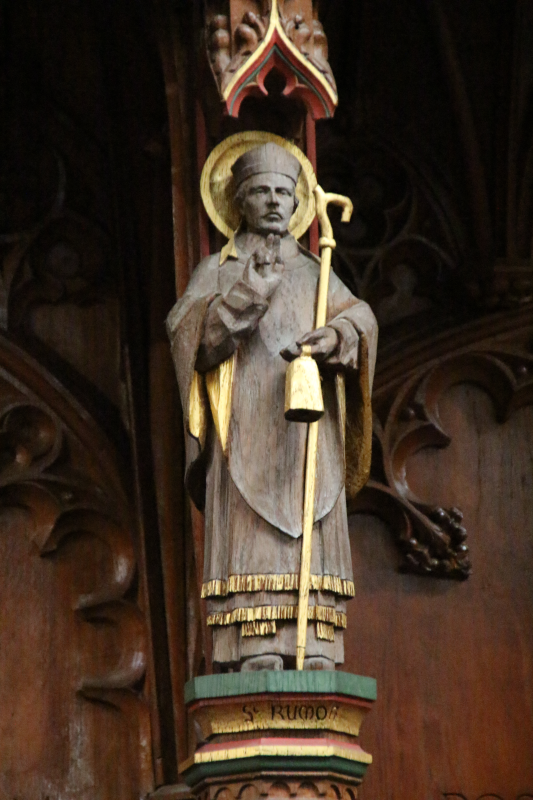 In his left hand is a bell inscribed with a Celtic cross, and in his right a pastoral staff with a crooked end. 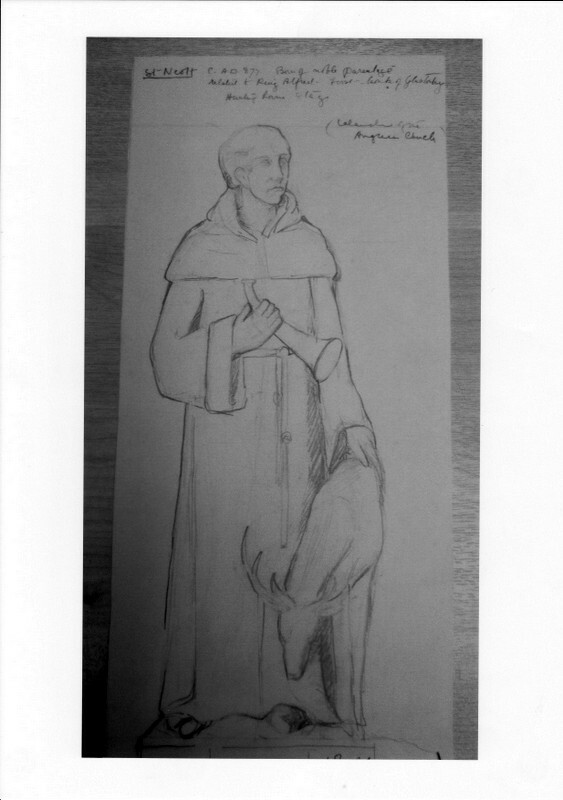 The original sketch showed a mitred figure in full priest’s robes and holding a staff with cross: one can suggest that this was not deemed suitably ‘Celtic’! Figure 420. NQ12. St Pol de Léon or Aurelian, inserted 1930–44 , is vested as priest. 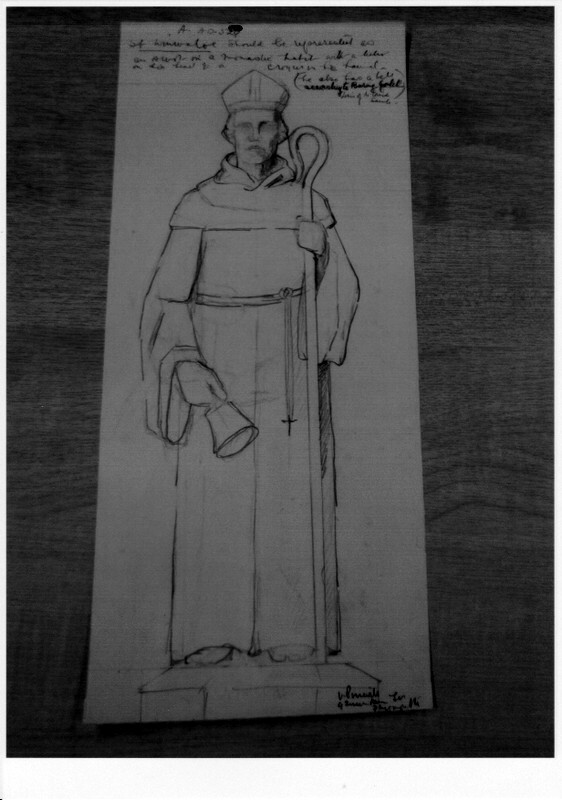 He is holding a Bible and pastoral staff with crooked end. Figure 430. NQ13. St Nectan, inserted 1930–44 , is in monastic habit. He is reading from an open Bible and holding a T-shaped staff. 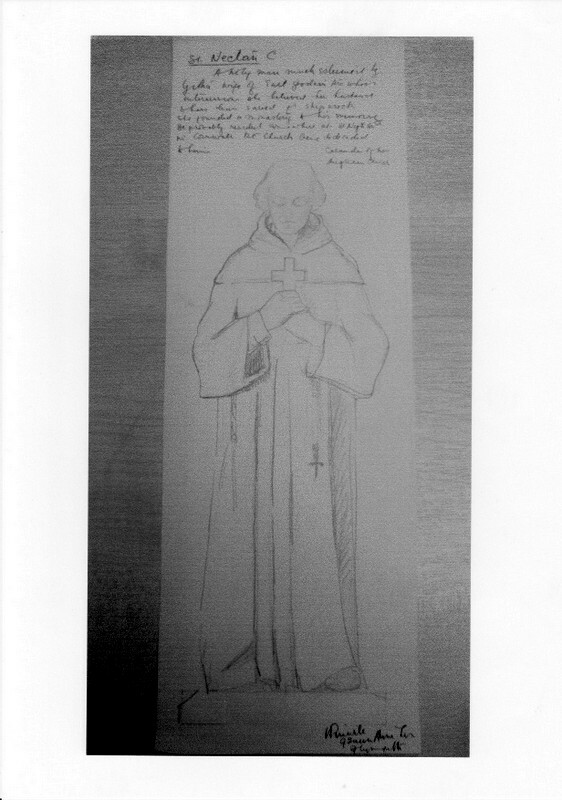 The original sketch was of a priest holding a cross in both hands and totally different from the clay model and the final carving. Figure 440. NQ14. 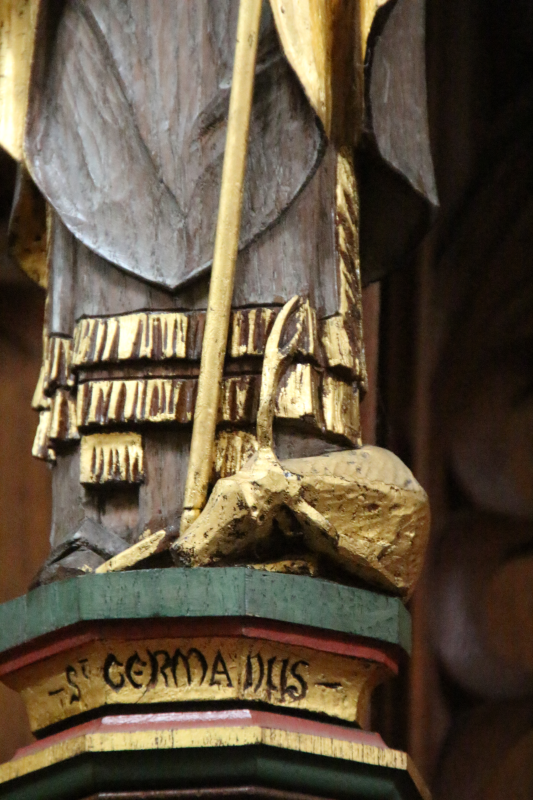 St Conan, inserted 1930–44 , is shown mitred and giving a blessing. He holds a crozier. Figure 450. NQ15. 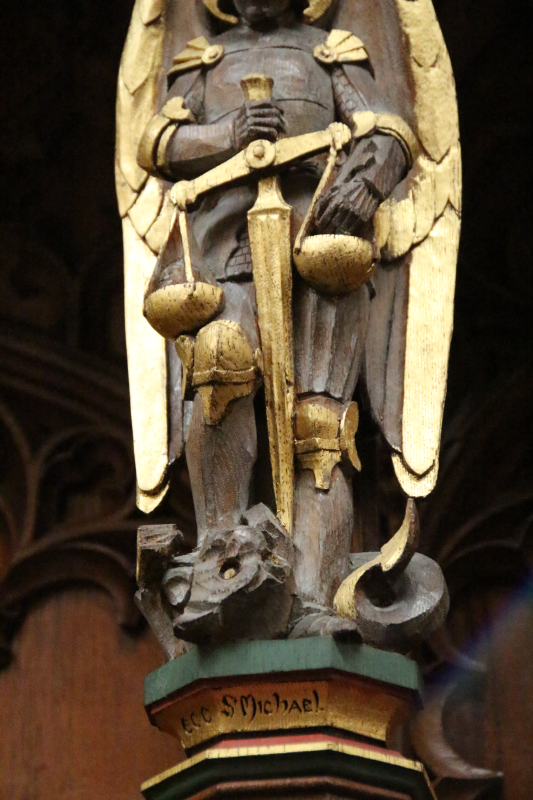 St Michael, inserted 1927 , is shown winged and in armour. 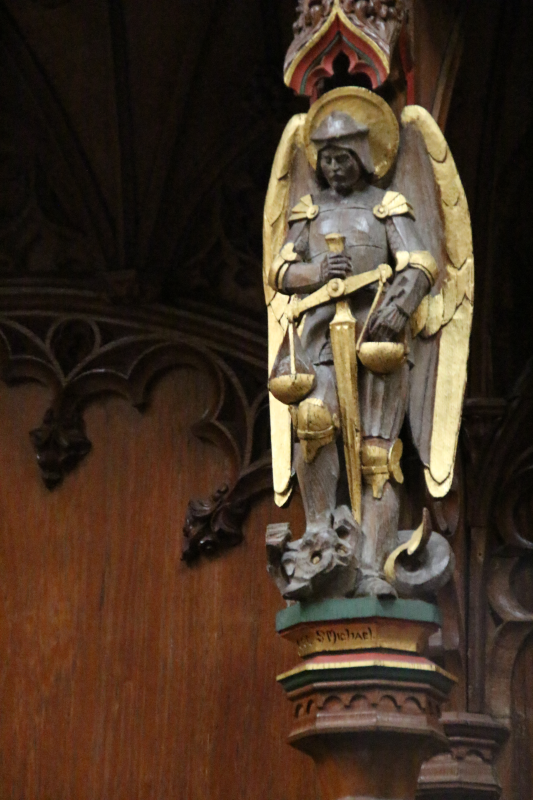 He is plunging a sword into a figure of Satan, and from the sword are hanging the scales of justice. 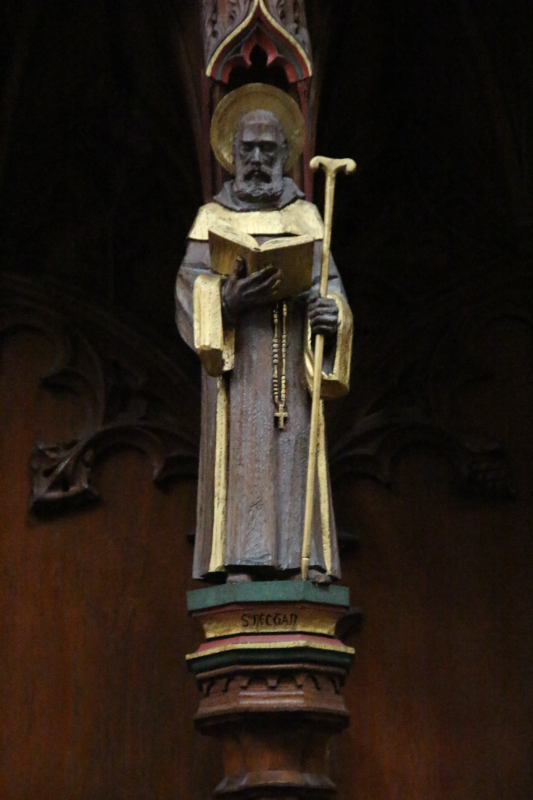 Given as a memorial to Dr GR Sinclair, first Organist of the Cathedral by the Revd Canon EC Corfe, Precentor 1904–29 , the figure was dedicated on 1st May 1927.24 A chart25 of the stalls of 1944 lists this figure erroneously as St Samson, after the Canon’s stall, but the figure of St Samson is in the reredos of the Chapel of St Samson and St Boniface. 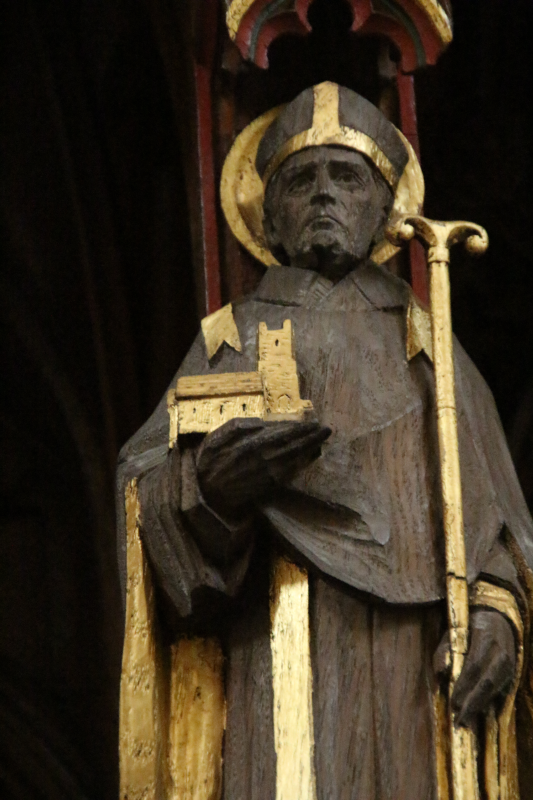 It was Bishop Benson’s intention that the early missionary saints who came to Cornwall from the 6th century onwards would have a prominent place in his new cathedral for Cornwall. 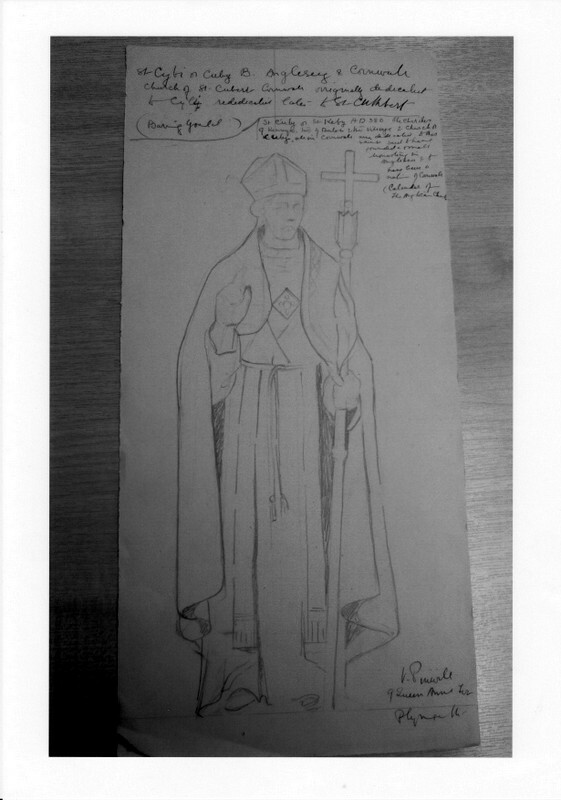 He, along with others, had a problem in the last decades of the 19th century in reconciling Celtic and Roman Christianity.27 It is significant that by the early 1920s Pinwill was consistently portraying the Cornish saints in the vestments and attire of the Church of Rome. 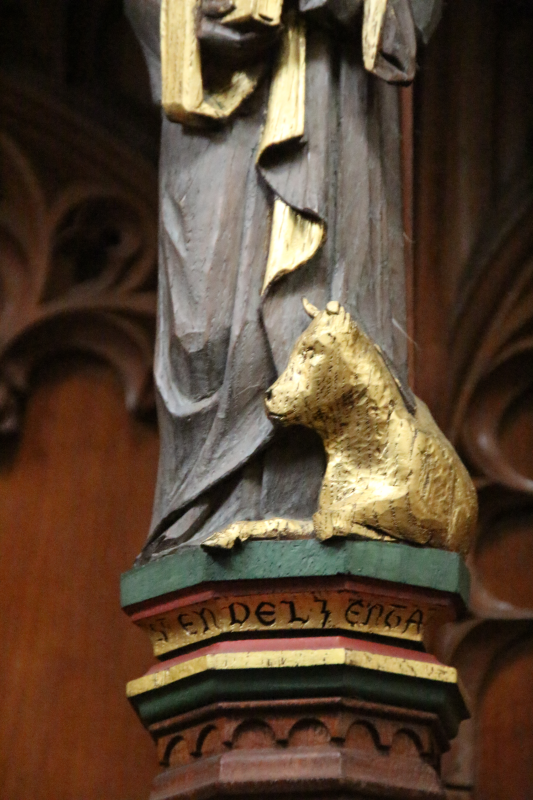 It is notable how Pinwill uses the attributes from medieval Cornish saints’ legends like pastoral staffs and bells which, besides being symbols of authority and presence of the supernatural, were also practical aids to travelling and preaching. It is also notable how often models of the actual Cornish church buildings are used to identify individual saints. Finally, there are two products of the Pinwill studio that fulfil neither liturgical nor decorative functions. Figure 470. IN PIAM MEMORIAM EMILIAE GLYNN GRYLLS ⅯⅭⅯⅩⅩⅩⅢ (In loving memory of Emily Glynn Grylls 1933 ). DOMINE DILEXI DECOREM DOMVS TVAE (Lord, I have loved the habitation of thy house} (Psalms 26:8). The St Endelienta Quire stall with memorial to Emily Glynn Grylls. Above the coat of arms (“lozenge”-shaped, for a female) is the Cornish motto Rag y mattern ha y pobel (for his King and his People). The arms of Grylls of Helston are or, three bendlets enhanced gules, (Burke Vol Ⅱ, 1837 ) and the Latin motto below the arms is Vires agminis unus habet (One man has the strength of an army). On the rear panel of this stall an added inscription (Figure 470) was carved by the Pinwill studio in 1943 .28 It consists of an armorial with mottos, and inscription dedicated to Emily Glynn Grylls 1933 . Figure 480. 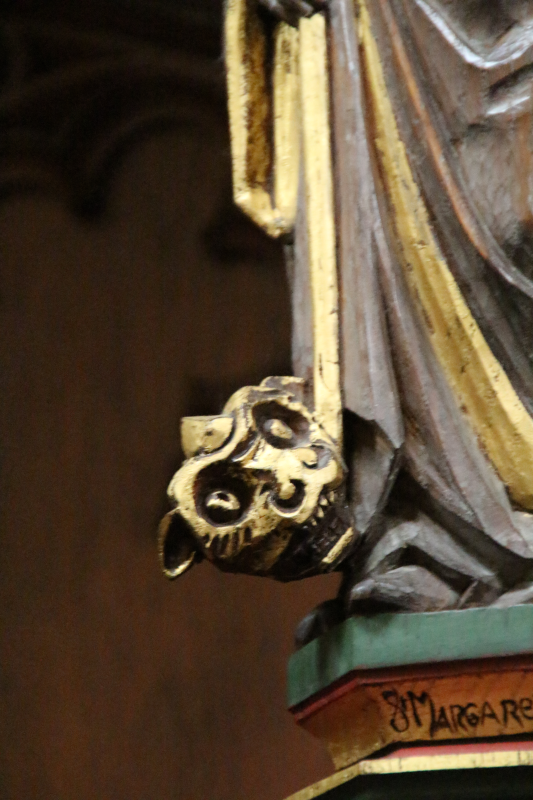 The upper parts of the original altar candle holders, now used to hold the ropes round the podium. Figure 490. The lower parts of the original altar candle holders, now modified with new candle holders. Figure 500. The altar candle holders in their original form. 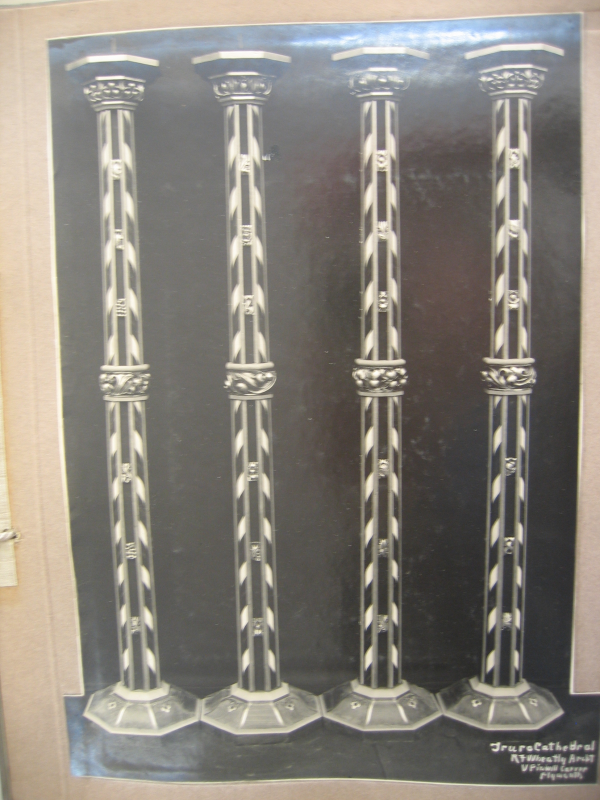 Originally these were four whole candle holders by the Pinwill studio for the Sanctuary, and had a defined liturgical purpose in the quire and sanctuary. Later each holder was divided into two parts. The upper parts including the central boss were inverted and provided with an added base for stability. They are now used as ‘bollards’ to hold the ropes round the podium. The lower parts have been modified with new candle holders and are still used for funerals. They are otherwise stored in the Canons’ vestry. 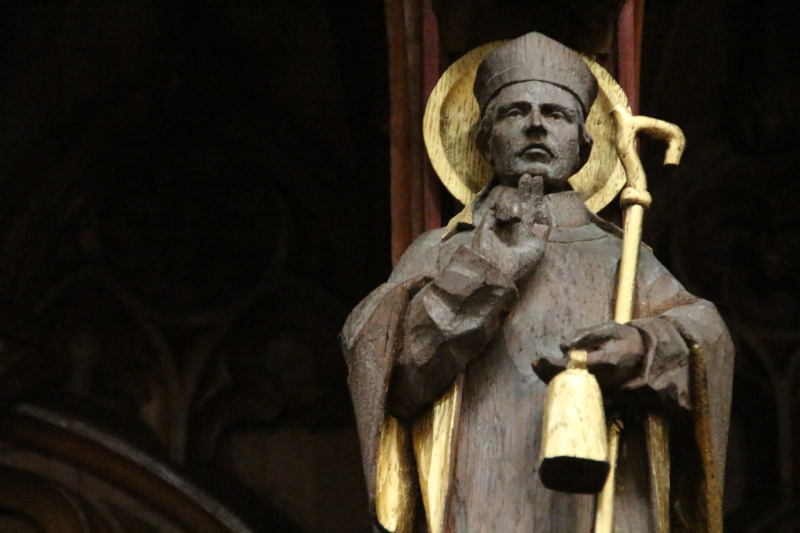 There are over fifty individual carvings from the Pinwill studio at Truro cathedral. Inserted over more than three decades, they are of significant interest not only in the context of the evolution of the fixtures and fittings of the cathedral, but also the way they reflect changes in artistic styles. Until the commencement of the First World War, the evolution of the cathedral and its fixtures and fittings was dominated by the Gothic Revival vision of John Loughborough Pearson and Bishop Benson. Although both died before 1900 , this vision was shared by the key individuals who were responsible for the ultimate conclusion of the building in 1910 . Frank Loughborough Pearson continued his father’s architectural designs with very little alteration, whilst the development of the cathedral’s interior was in the hands of Chancellor Arthur Worlledge and Canon Arthur James Mason, who might be regarded as Bishop Benson’s disciples. After 1918 , the shadow of Benson and Pearson faded, especially under Bishop Frere, whose reordering brought a new interpretation to the functions of the building and its artistic expression. This was particularly shown in the creation of new Chapels (the Jesus chapel and the chapel of St Samson and St Boniface) and the progressive completion of the canopies to the quire stalls.30 The dominance of the Gothic Revival style gradually merged into that of the Arts and Crafts, led by the products of the Pinwill studio. 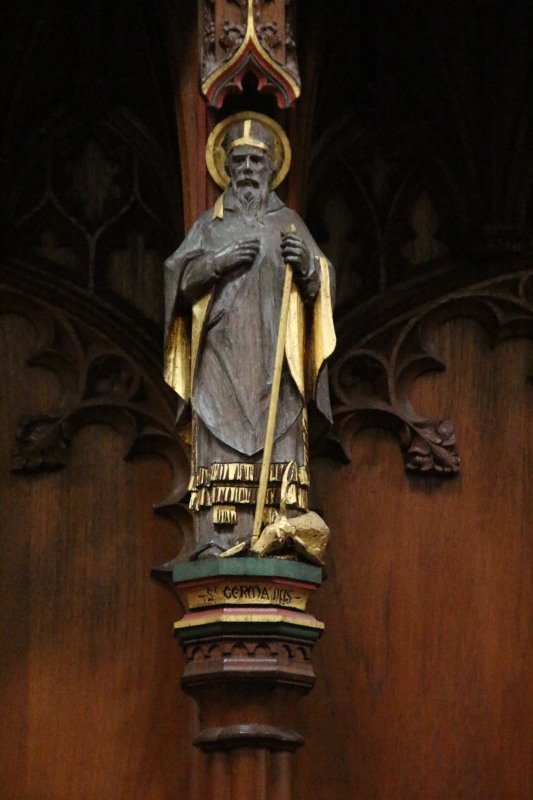 As has been shown, the Pinwill carvings played an important part in defining the manner in which the Celtic Revival and the Cornish saints were interpreted. In one further respect Violet Pinwill led the way in the artistic development of the cathedral. With the commissioning of so many items from the Pinwill studio, the cathedral was for the first time using a female artist and designer. This trend towards female artists had already started before 1914 when the Pinwill studio produced the outstanding carvings for Father George Metford Parson’s restoration of his church at Crantock.31 Female Arts and Crafts designers were also achieving prominence in stained glass, witness the fine window by Mary Lowndes at St Erme of 1911 . 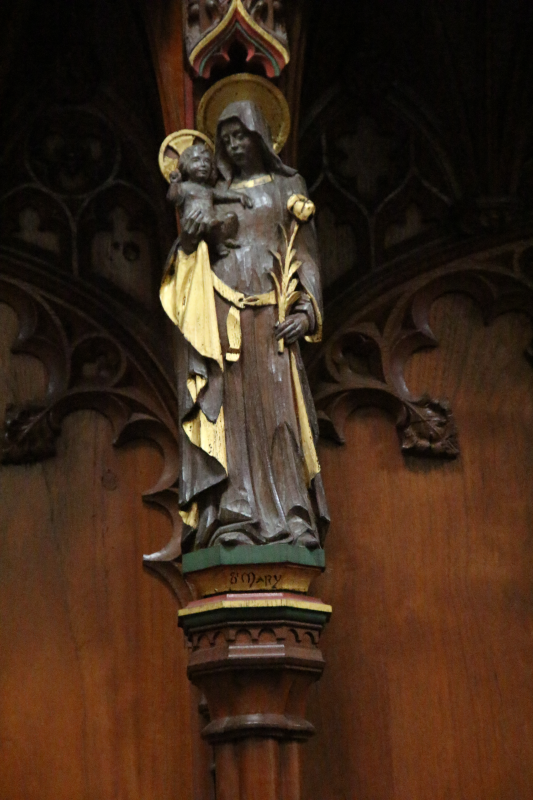 Mary Lowndes was, like Violet Pinwill, a highly successful entrepreneur running her own stained glass business in London.32 Another important example of this trend towards female arts and crafts was Anne Walke’s reredos for the new Jesus Chapel. It is within this context that the Pinwill carvings at Truro cathedral can now be seen as a significant historical and artistic development. The authors would like to acknowledge the generous help and advice given by Helen Wilson in the preparation of this monograph, and the information given by Elizabeth Stewart on the Cornish Grylls motto. Truro Cathedral Inventory (TCI) record 343. Death of Lady Mary Trefusis on 12th September 1927 reported in The Cornishman and Cornish Telegraph 14th September 1927 p 5. Forthcoming installation of reredos in memory of Lady Mary Trefusis reported in Western Morning News 22nd July 1931 p 2. MG Swift, P Lambert and J Whitehouse. Truro Cathedral Baptistery , Truro Cathedral monograph No 3. Cornwall County Record Office (CCRO) TCM/424/1. 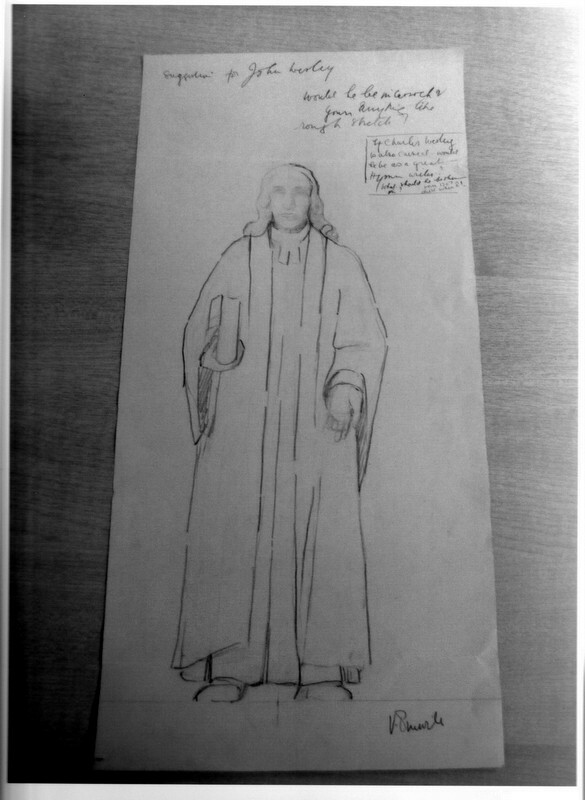 Unused sketches by Violet Pinwill of John Wesley and St Bartholomew. In addition are sketches of John Wesley and St Bartholomew, neither of which was commissioned, and with no indication of their possible location. TCI record 375 and inscription. TCI and inscription. Death reported in The Cornishman and Cornish Telegraph 6th July 1933 p 4. TCI record 790 and inscription. TCI record 1534. John Claude Daubuz died 10th April 1915 ( West Briton 12th April 1915 p 3). The Book of Remembrance and carved desk were lodged in the Cathedral during the Armistice Day service in 1921 ( The Cornubian 17th November 1921 p 5). The Daubuz memorial was dedicated on 25th June 1922 ( The Cornubian 29th June 1922 p 6). The window inscriptions list the family as Daubuz . Devon County Records (Plymouth). Back shelf:- Winwalloe, Constantine, Buriana, Conan, Ia, Piran. Lower shelf:- Germoe, Aldhelm, Meriodocus, Nectan, Germanus, Carantoc. Fully shown in panels in window n7 of 1500 at St Neot parish church: J Mattingly and MG Swift, Pre-Dissolution stained glass in Cornwall . Also fully shown in panels in window n7 of 1500 at St Neot parish church: J Mattingly and MG Swift, op. cit . This figure is not included in TCI. Window n6 of 1500 at St Neot parish church: J Mattingly and MG Swift, op. cit. . Framed in the Canons’ Vestry. EW Benson, The Cathedral: its necessary place in the life and work of the Church , p 159, London, 1878. On his intention to name the Canons’ stalls at Truro Cathedral after the Cornish saints to read into a record of our own past, and of our connection with the other antient [sic] churches prior to the Romish usurpations. Emily Glynn Grylls died 11th June 1933 ( The Cornishman , 15th June 1933 p 4). Insertion of carving reported in the Western Morning News , 15th December 1943 p 2. Quoted from a newspaper article: information kindly supplied by Helen Wilson. Old Cornwall magazine in 1925 gives the Cornish motto as Hag y Matern ha y Pobel and Robert Morton Nance writes, around the same time, Ha’y Maghtern ha’y Bobel. TCI records 1773–6 and 1786–9. Donors were sought for £150 per canopy. MG Swift and J Stewart-Smith, The stained glass windows of St Carantoc, Cornwall . Establishment of The House of Glass in Fulham in 1911 by Mary Lowndes and Alfred Drury, preceded by Sarah Purser’s Tower of Glass (An Túr Gloine) in Dublin in 1903 .